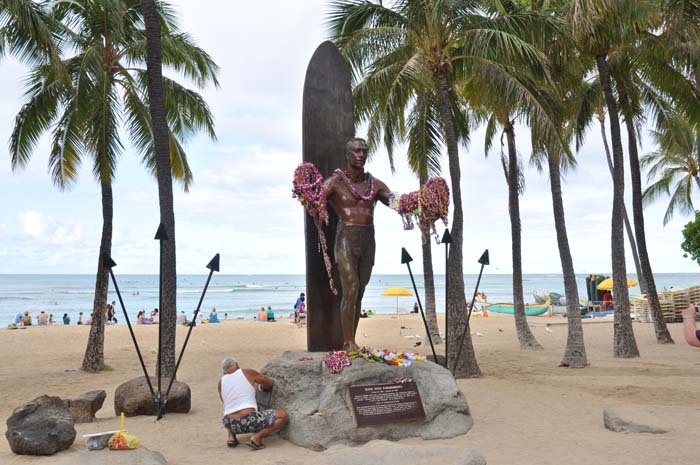 HONOLULU, HAWAII, TO SYDNEY, AUSTRALIA, SEPT 27 - OCT 15, 2011. 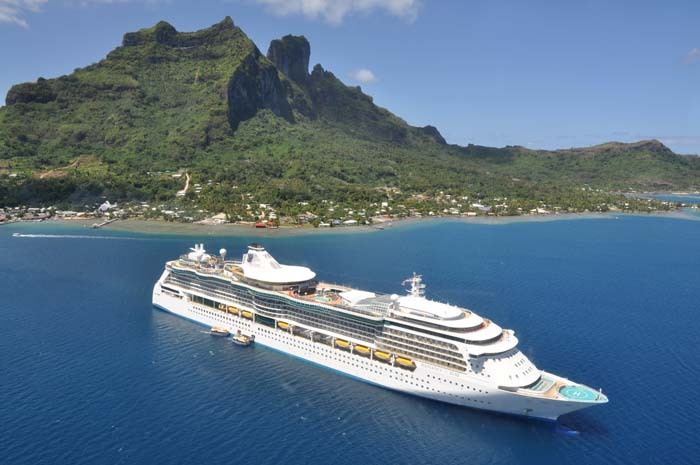 Radiance of the Seas moored at Bora Bora. This was our first cruise. It was Nat's birthday (rude to say which) and she happened upon the idea of a cruise. While we'd looked at the photos and read as much as possible, we didn't quite know what to expect. 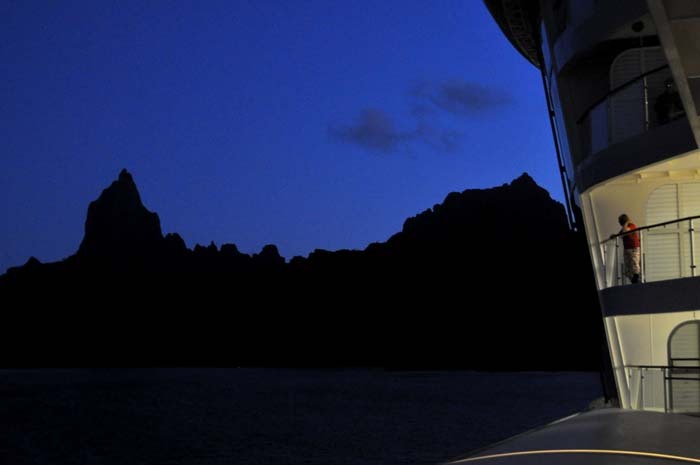 The 17 nights we were on board exceeded both our expectations. We didn't want to leave. Before setting off we'd tried to find one place that could answer all the questions we'd been asking. We couldn't find one place that answered all of them, so we decided to make our own blog with as much info as possible in order to answer those questions we'd asked, and you might ask. Another thing that annoyed us was the poor quality of images. I (Giulio) am a photographer and set out to get as many photos that conveyed the feeling of what it was like for us. In many cases a photo really is worth a thousand words and I wanted to express this. Other than facts and figures, we have tried to keep the text to a minimum and let the photos 'do the talking'. 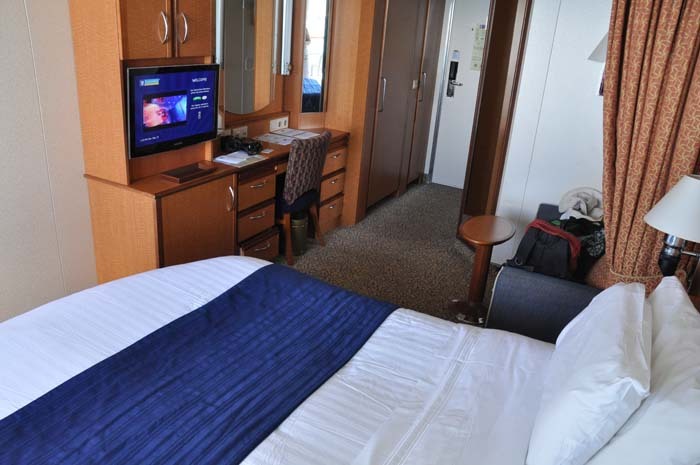 Sailed on Rhapsody of the Seas in April 2011. 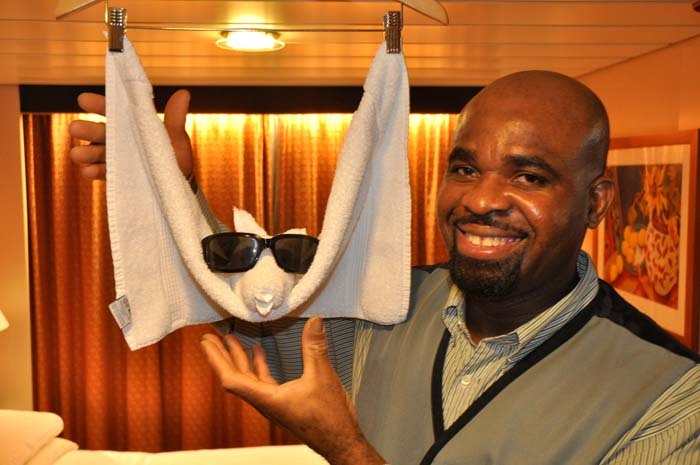 Now looking forward to our 7 night cruise on Radiance in February 2012. Enjoyed reading about your experiance. Thanks Anonymous, The intention was to make people experience the Radiance as best they could without being there, so it's good to see the blog did this for you! 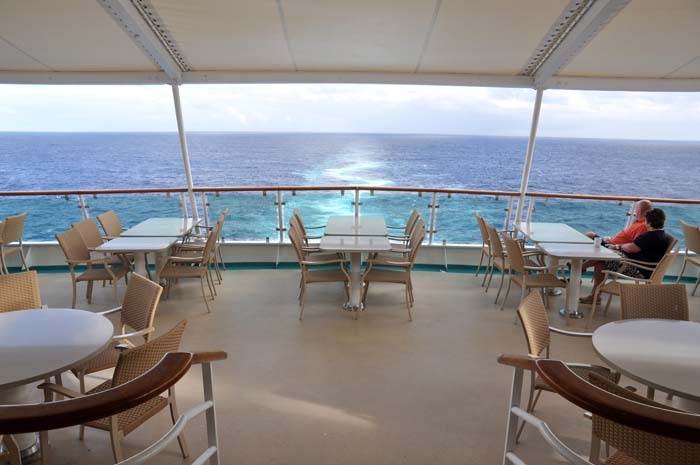 Enjoy your time on Radiance - we're sure you'll love it! Absolutely loved this, we are on the Radiance in February and I think you must have included every bit of info that there is.Photos were brilliant.We are in a "hump cabin" which looks very like yours so those photos were great. Fantastic blog, we, like you guys had trouble finding information. We are off to New Zealand in Jan. We found a lot of info through this. Well done. Anon - Nov 21 - Enjoy your Feb cruise! The cabins are great for the time you spend in them. We enjoyed hanging out on the balcony and even invited friends over for a pre dinner get together. 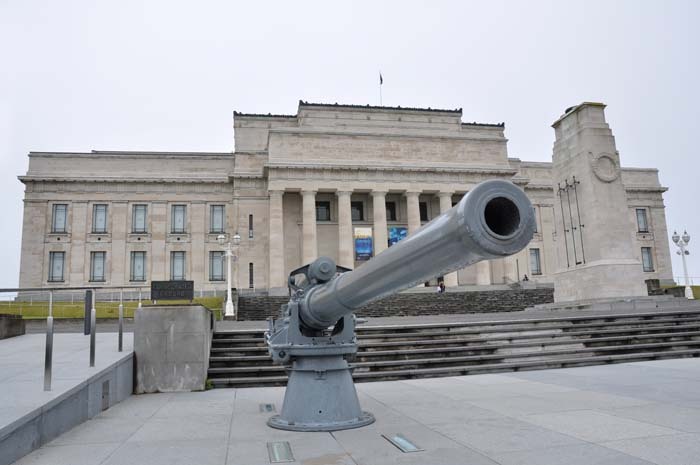 Anon - Mike and Belinda - We really want to go back to NZ and spend some time there, on a cruise or otherwise. So glad you found this blog helpful. Thanks for taking the time to comment! Excellent reporting and great photos! 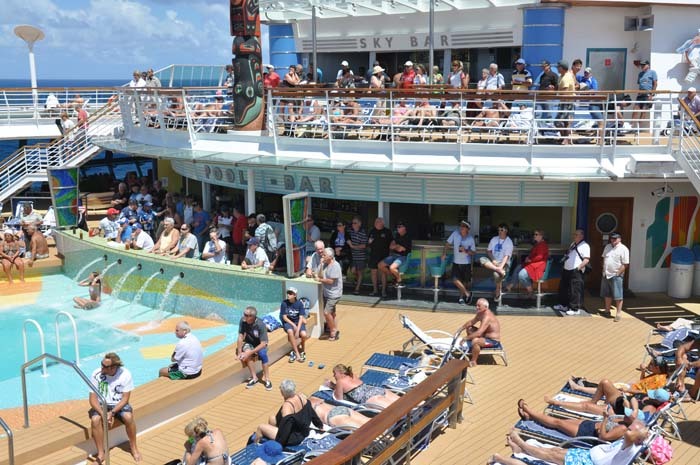 Your detailed information will be much appreciated by other first-time as well as seasoned cruisers. Thank you for taking the time to post! Thanks for your kind words Helga. There were so many questions we wanted answered, as well as wanting to use BIG photos to convey the experience, so being able to put it all together as we have has been great. We get a buzz out of the fact other people such as yourself love reading the blog! This blog is getting fantastic reviews on the RCI discussion page where it can be viewed! I cannot tell you how much we have enjoyed reading your blog.. We just loved each and every word and the photos's are fantastic..
Our cruise on Radiance is in March to the Pacific Islands and after reading your blog, my husband decided he wanted to do something special for the two of us and has booked us in for the Chef's table, so we are very excited about that, but we notice a couple of your photo's regarding the Chef's table have disappeared.. Just one little question, do you get an apron and a copy of the recipe book each or just one per couple.. Thank you so much for taking the time to do this blog.. We keep going back and looking at it over and over and over again..
We're so glad you like the blog and we appreciate your kind words. We loved doing the blog and the response we've received has been so positive. 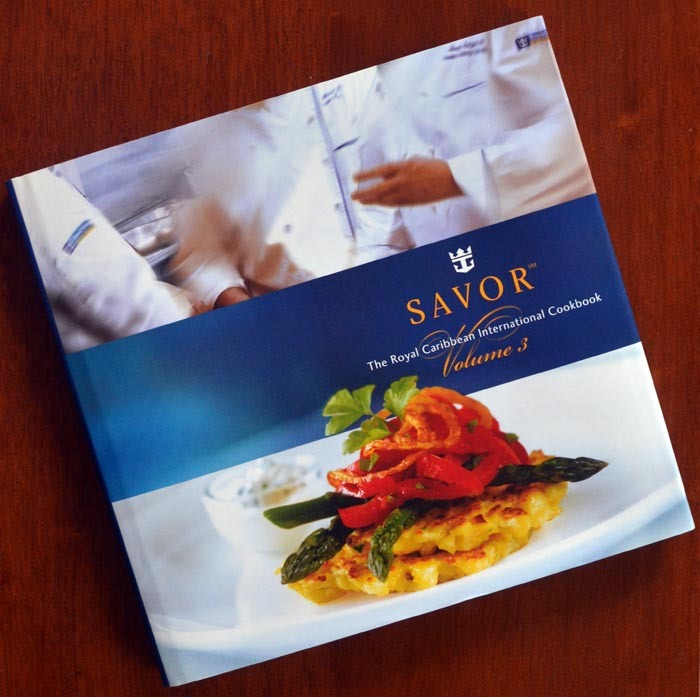 As for the Chef's Table, you get an apron each and one cookbook per couple. 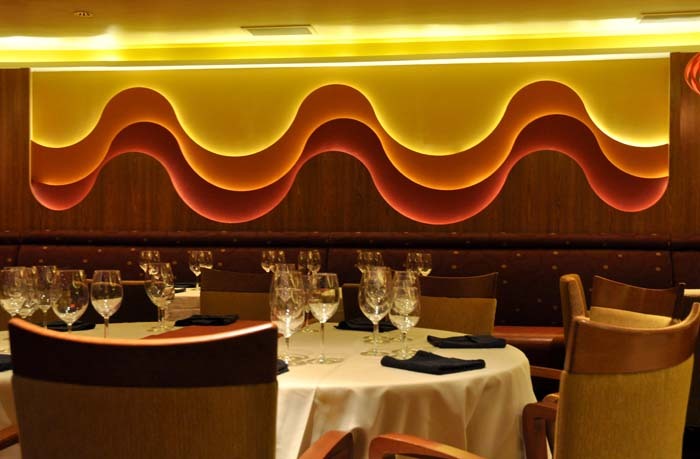 We're sure you will love both the Chef's Table and the whole Radiance experience! 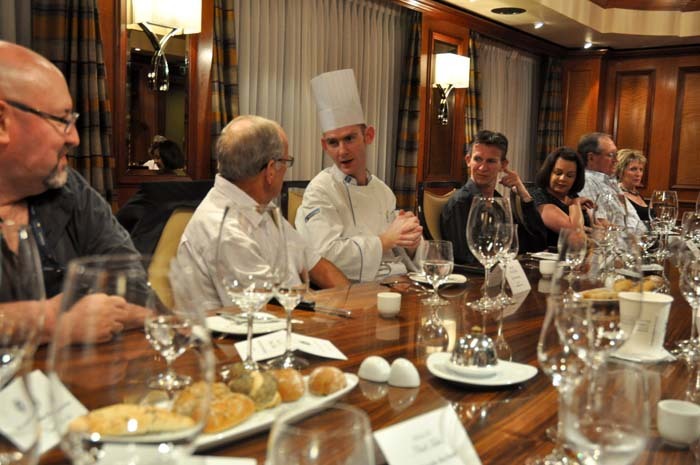 As for the photos of the Chef's Table, We checked the blog and all 3 photos were there. Please let us know if you have any continuing problems with the photos. Another thumbs up and many thanks for your amazing informative blog and the wonderful photographs. 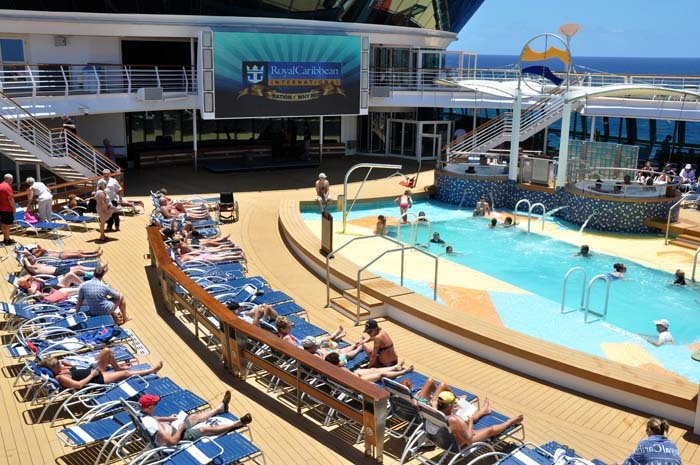 I saw a link on Facebook about a week ago and shared it with a Facebook page for our Radiance sailing in January as well as our Cruise Critic roll call. I have seen it linked in almost every Radiance roll call coming up in the next few months so it sure is getting lots of attention and so much positive feedback. 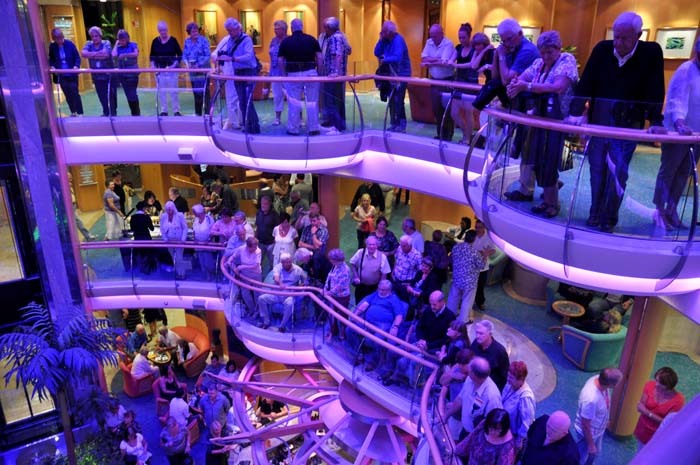 Yes cruising is so addictive isn't it! We are going on Radiance in January and can't wait - thanks again for going to so much trouble. P.S. If you would like to come on Jan 15th I would love you to be our official photographer - lol! Thank you for your lovely comment. We're pleased that the review has been shared around and hope it has been useful. 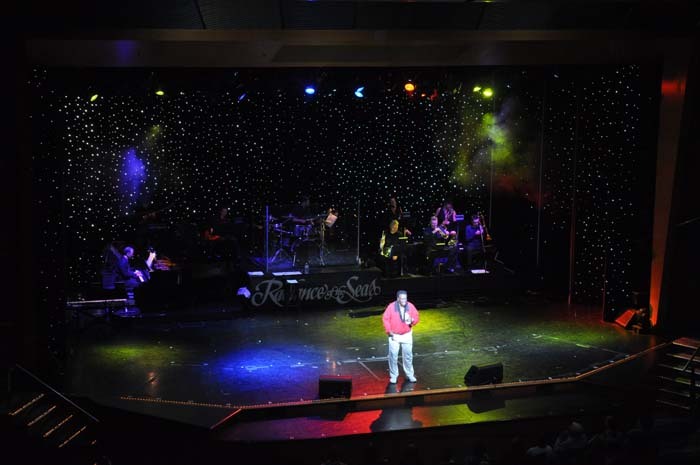 We really enjoyed creating it and look forward to future cruises where we can do the same. 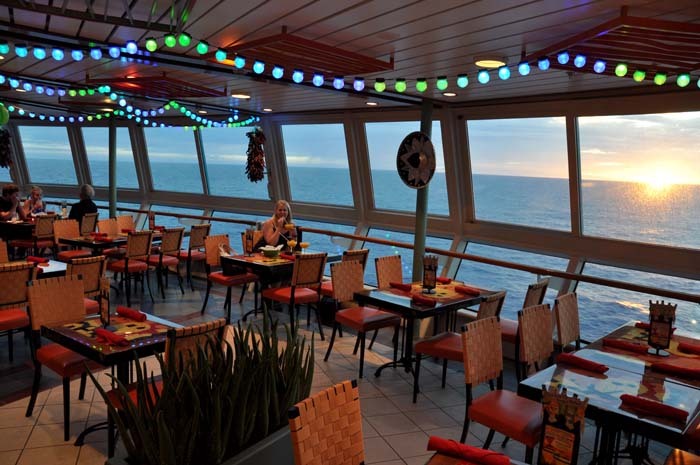 How exciting that you are sailing on the Radiance in January! Enjoy the cruise! Many thanks for your very informative page, I too have shared it on facebook and look at it daily as I am counting down to my cruise leaving on the 3rd January (23 days for the record)! 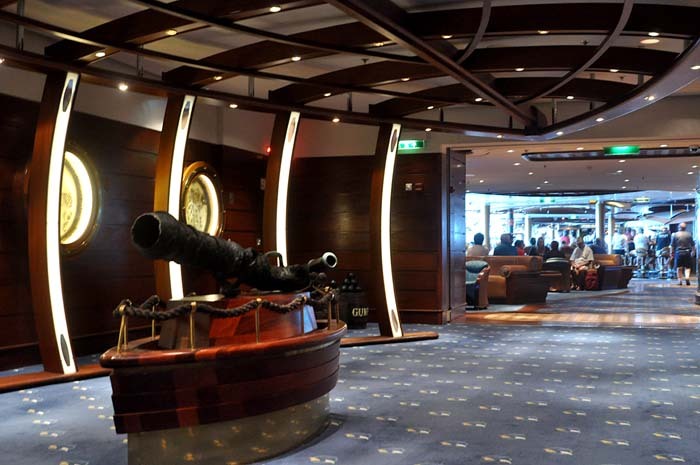 I have cruised many times over the years but never with RC but have been in and seen the Ship in Sydney a few times and she is enormous and impressive, and your photos are brilliant. The only little question I have is the necklace for your seapass, you buy them as you check in? Cruise Guru were giving them out the other week at the pier but said you need to then get a hole put in the pass for theirs to work, plus one was broken, and I have been shopping around looking for one, but believe its probably just as easy to buy what they supply? 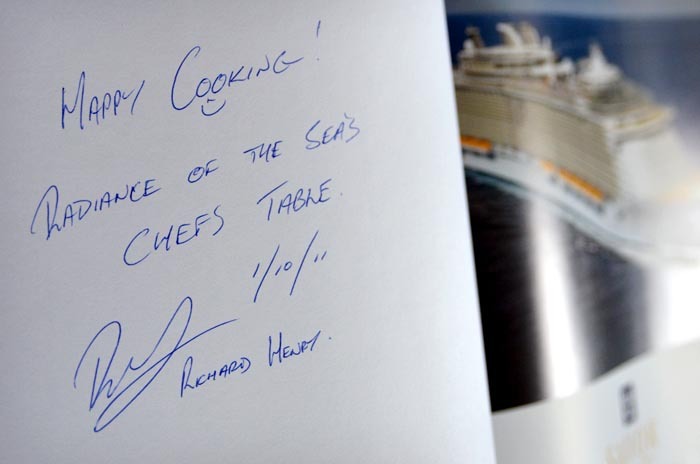 Its a keepsake too if they have the cruise ship name on them. Let me know other than that every conceivable question I may have had you have already answered! (Giulio here) Thanks for your message and your question re the necklace/lanyard is one we will amend on the blog. When we checked-in we were only given the seapass. Initially we kept it in our pocket or wallet but this wasn't always 'satisfactory' (things have a habit of falling out of pockets and wallets). We kept seeing people with the seapass on the lanyard and thought 'that's a good idea'. I think Nat asked someone and they said they'd bought the lanyard in the onboard shop and the guest services desk punched a hole in it so they could clip it onto the lanyard. Sure enough, we bought a lanyard ($4.95), got a hole punched it it etc and spent the cruise with it around our neck. The other good thing was the bottom part of the lanyard can unclip, so you could take the seapass off if you needed to hand it over to pay for drinks etc and then clip it back on. It seemed everyone cottoned on to the fact this was 'the way to go' and the seapass 'necklace' was a very common sight. 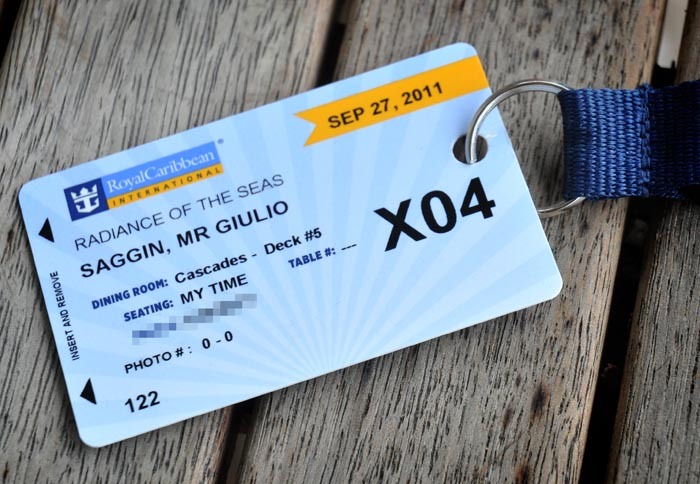 It would be good if Royal Caribbean included the lanyard with the seapass and they may do this but, unless things have changed, you can either bring your own lanyard or pay the $4.95. Enjoy your cruise! We are booked to go on one (not RCI) on Feb 4 and are excited about that. Yours is a month earlier, so you must be doubly excited! Once again, thanks for your query - we'll add that bit of into to the blog. Glad the post was of help to you! 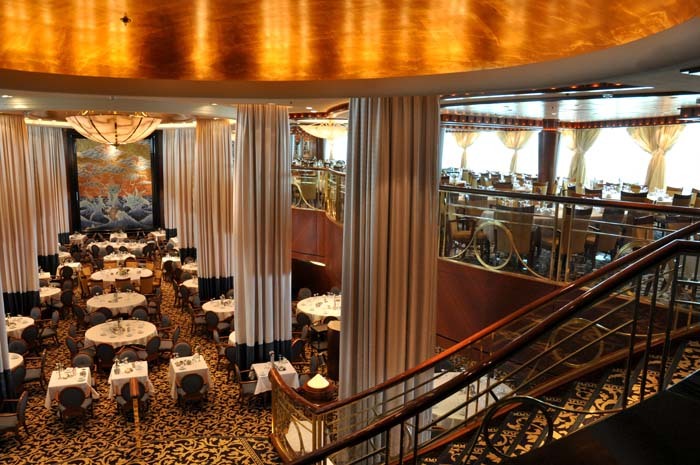 Radiance is a magnificent ship and we're sure you'll love your time on board. As always, we are envious! Have a great time and please drop us a line at any time (especially afterwards, so you can tell us all about it). Have been meaning to comment for a while on your wonderful blog. We were on this cruise at the same time as you and we loved every moment of it. We too did not want to disembark. 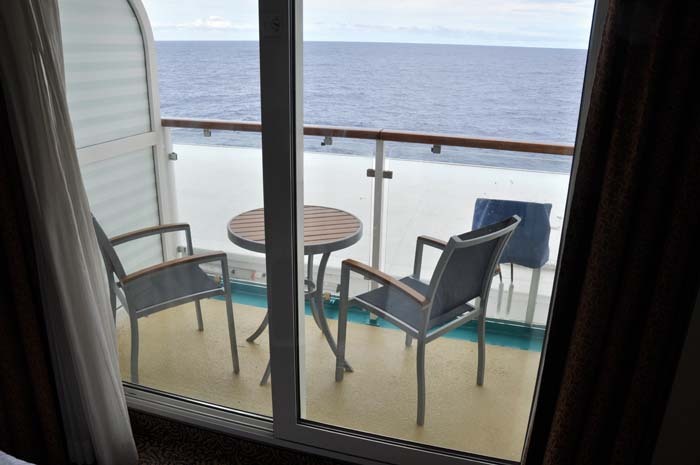 We had an aft balcony cabin which we thoroughly enjoyed. Bora Bora was a little paradise on earth and Moorea also was beautiful. Your photos are wonderful and bring back all those great memories. 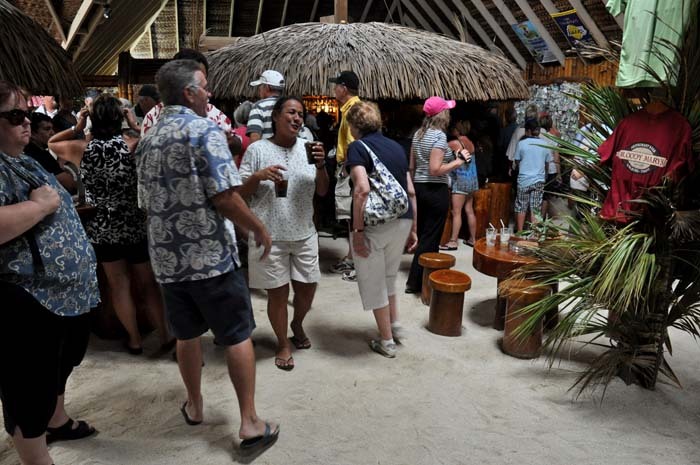 The Schooner Bar was a favourit hangout for us along with the wonderful people we met face to face after chatting on a roll call on cruisecritic for many months. Once again, thank you both. Thank you so much for your fantastic blog. So much information that I was having difficulty finding elsewhere. 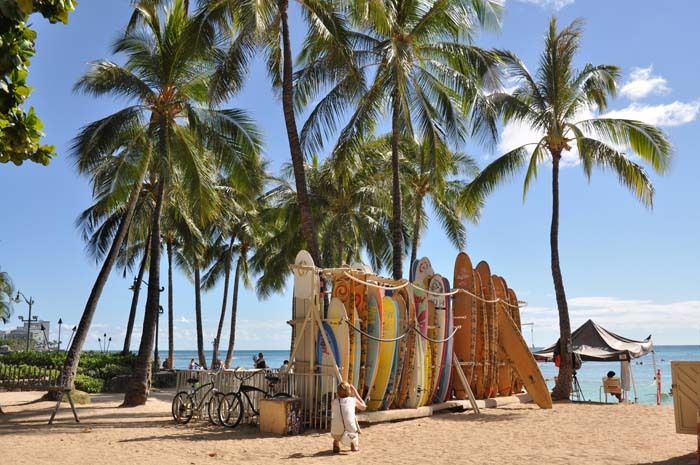 I am just in the process of booking Sydney to Honolulu for April 2013. Would actually prefer to do reverse trip like yourself, but don't see the itinerary out yet. One quick question, I will be travelling with three kids - 17, 11 & 5 immediately after school holidays. I was hoping there will be sufficient other children for them to spend their time with. Did you travel out of school holidays and if so, were there plenty of kids on board? Thanks for your kind words about the blog. 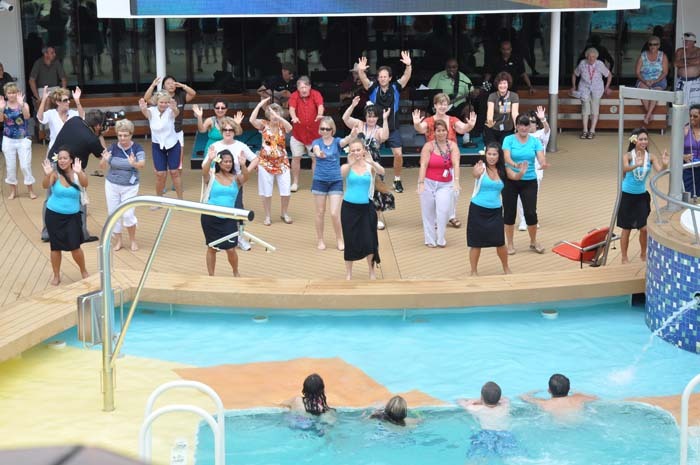 We still look at the blog and relive the memories of the cruise and love it! We recently booked ourselves on the Voyager of the Seas, cruising from Singapore to Fremantle, in October 2012 - and we're counting down the days already...189 to go! 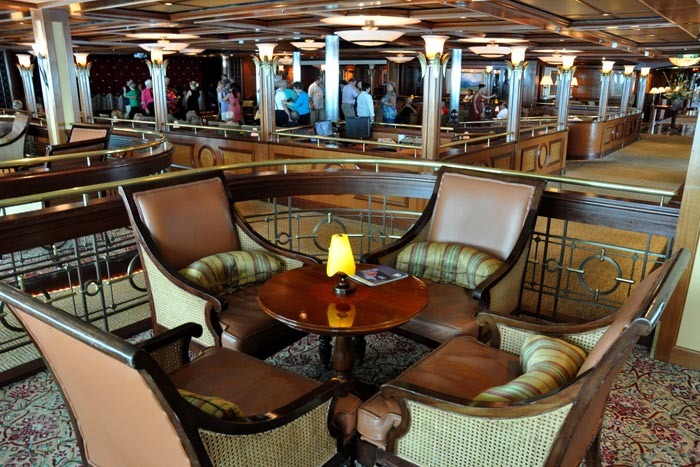 Happy cruising and hope to see you in a Schooner Bar on another RCI cruise in the future! Like you, we had trouble finding all the info we wanted in the one place before we cruised, so that's why we did the blog. It's good to know it's done its job of answering all those questions you had! As for your question re kids, we're pretty certain we sailed out of school holiday time. There did seem to be enough kids 'floating around' but, to be honest, they had their own areas and tended to stick to them. 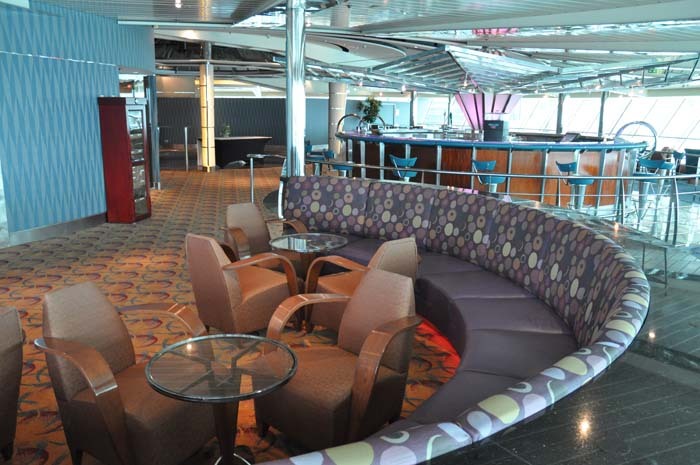 We did have a bout of norovirus on the ship and they closed down the kids areas and we noticed quite a few around. They should be okay. April 2013? Has the countdown broken through the 365 day barrier yet? 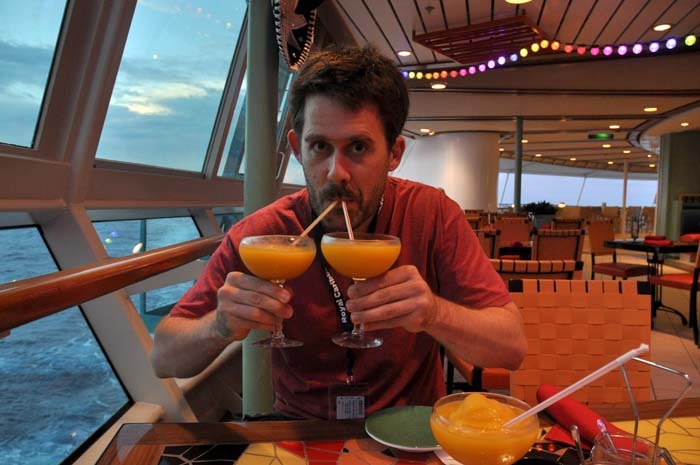 In case you haven't read any of the other posts here, we're booked on Voyager of the Seas, cruising from Singapore to Fremantle, in October 2012 - and we have 189 to go! Having not been too impressed at the information put out by RCI and many questions unanswered by the corporate side of their business I searched for unbiased info. Your blog was brilliantly informative and very well presented for cruise travellers.I am on this ship next year December 2013 whilst on an extended stay (6 weeks) with family in Mebourne We will be going round the south pacific for two weeks to give my family a break from us.Also we are going to spend some days up at cairns seeing the great barrier reef etc. I will email you seperately if you have any tips about this area. One small question about spending money on the islands where they use the french pacific franc. Was the US dollar readily acceptable there? 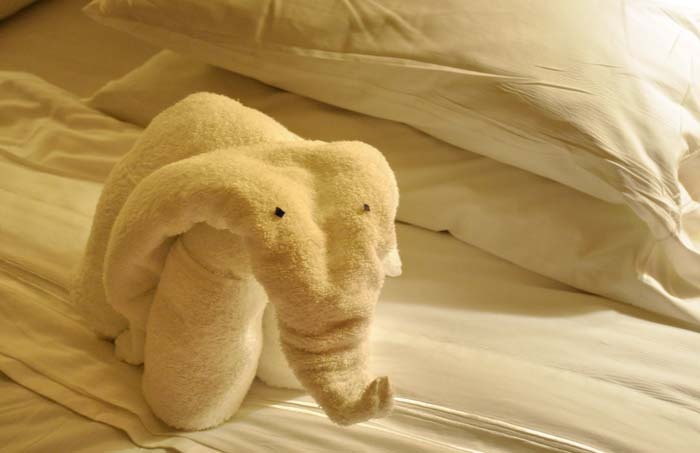 Thanks for a great blog and I am looking forward to your trip on the Voyager of the Seas. 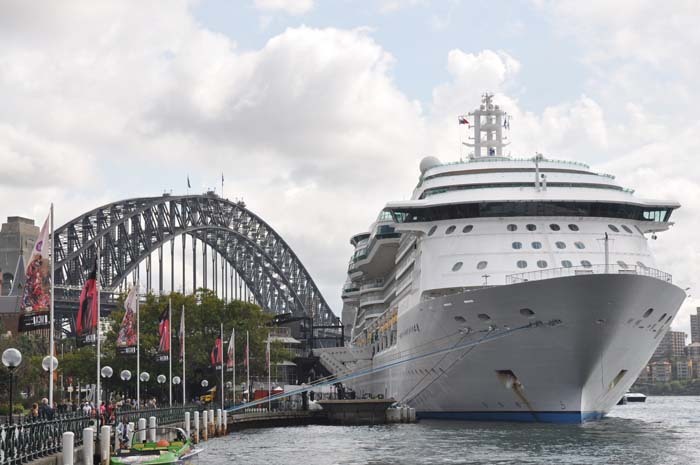 We are doing our first ever cruise on Radiance in January 2015 out of Sydney (our home city). 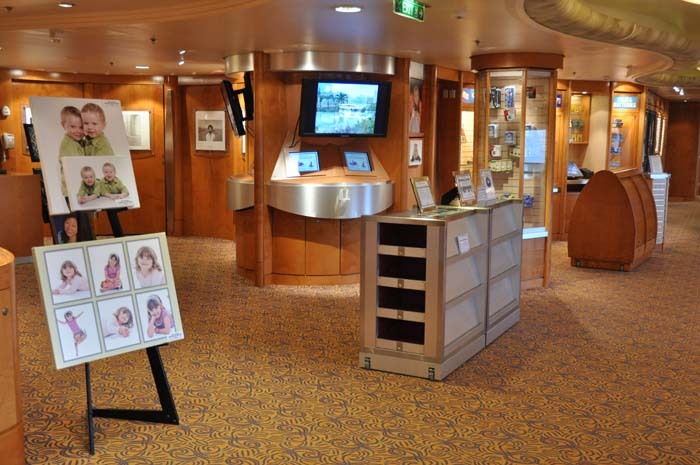 Even though it is some time away yet, and we have friends who have sailed her, we still have some unanswered questions about cruising. I really appreciate ypur work in putting this together...it was very helpful. Also as an enthusiastic photographer myself, I really appreciated the the quality of the photos. Can't wait to have my wife read this blog too...big Thankyou! We are leaving on Radiance in the opposite direction in 4 days. Your blog was just what we needed and had not found on the RCCL website. The presentation is absolutely fantastic and I know just how much time and effort is put into something like this. What time are movies at night and are they OK for kids? What is best way for money in various stops. Assume NZ OK but concerned about pacific islands electronic banking? 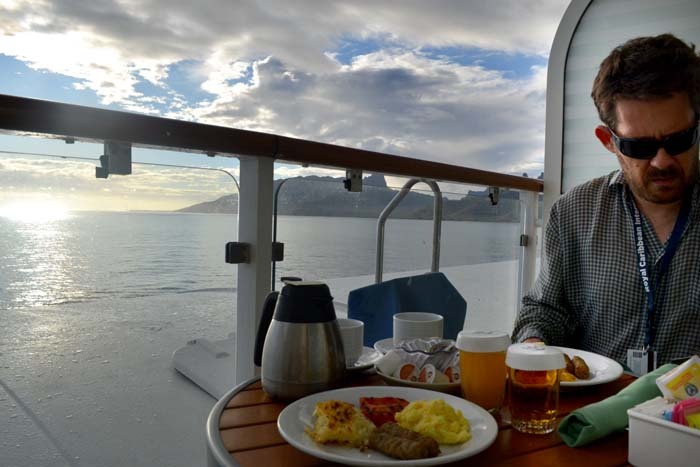 With such a long cruise, did you do a drink package and with hidsight, what would you recommend? You are great and amazing! Everything is so informative and detail. I am really enjoy reading your blog. Thanks. 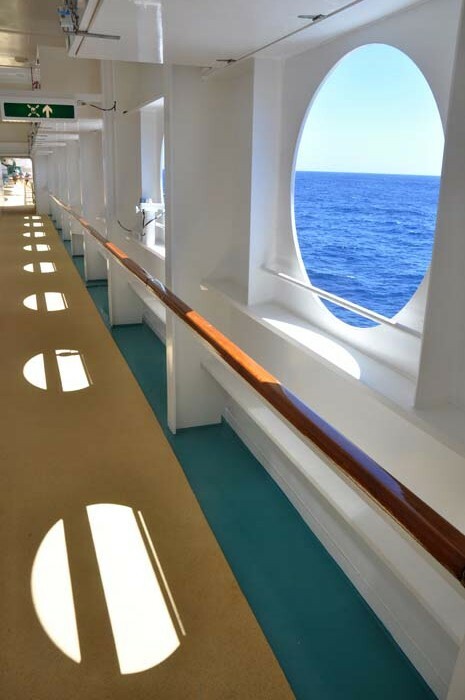 We love cruising. And i did write sth about my trip. However, my blog is in Chinese. Sorry! 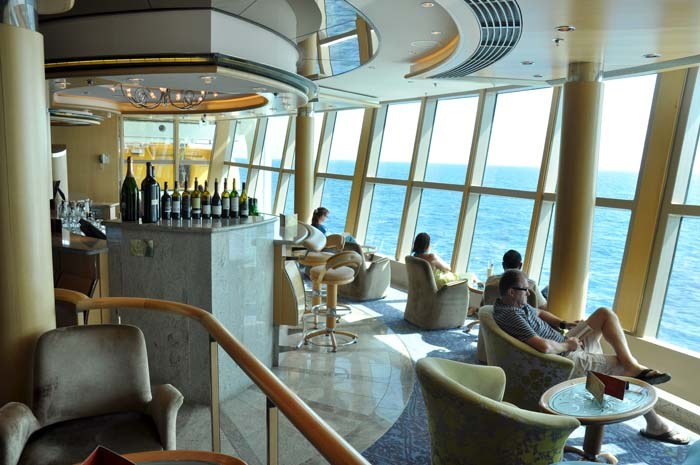 We will cruising on Radiance of the seas 2015 March and will write sth after the trip. Thank you for your lovely comment and we're glad you like our post. 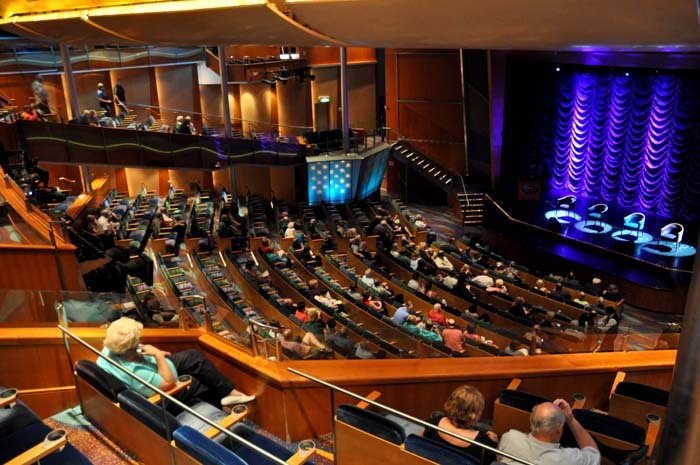 We hope you have a wonderful cruise on Radiance o the Seas! 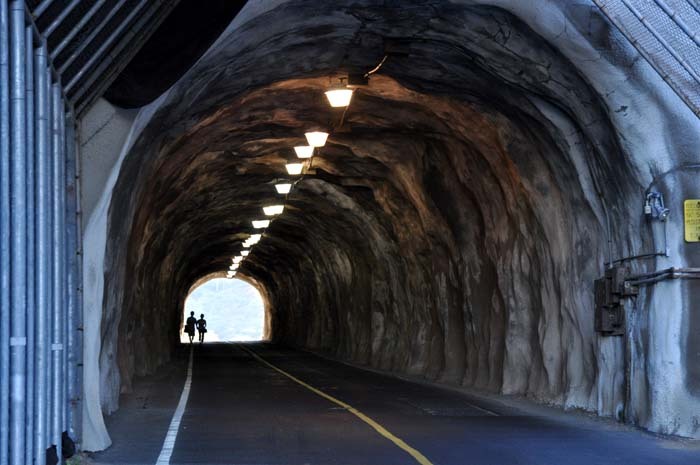 Hi Guilio & Nat, so glad we stumbled upon your blog! Very imformative, & your excellent first-hand photos, make the Royal Carribean pics, that are smattered across so many websites, pale into insignificance. The RC publicity crew could learn a lot from you!...Thank you for sharing your experience. 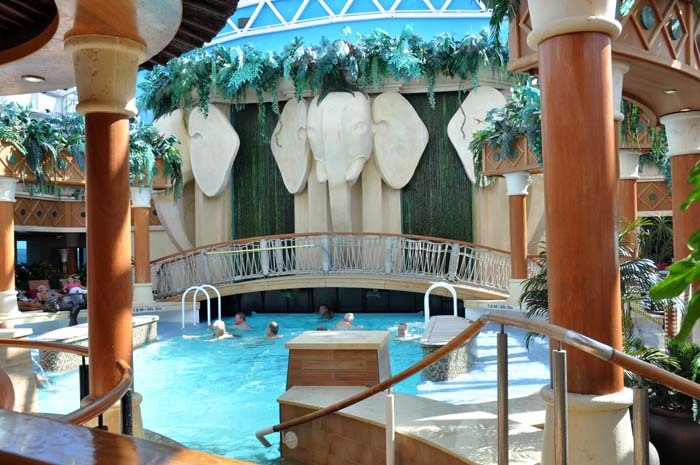 Your blog confirmed we made a good choice booking on Radiance. greetings from tasmania........google figbat oswald and see if you can work it out. coldplays' last 4 albums......"vertigo" by U2 (my first name is phil). an elimination is a day when you experinece strong flu-like symptoms and feel terrible. bad stuff is washed out of your body. No Sweat is a Clothing online business based in Australia. Our high quality No Sweat Non Iron/Wrinkle moisture wicking shirts can be worn in Summer or Winter for business or casual for men or women. Here are available non wrinkle shirts, non iron shirts, non wrinkle dress shirts, non iron business shirts, business shirts Australia, Dress Shirts Australia, business shirts USA, Dress Shirts USA; women’s dress shirts and women’s business shirts. At golfclubexchange.net, we accept that paying little regard to what business you're in, It's About People. Our complete target is to make an affiliation that gives trademark worth to everybody included. golfclubexchange is best place for Discount Golf Accessories on Sale, Rebate Golf Accessories on Sale, Discount Golf Accessories, Used Golf Clubs and Discount Golf Equipment, Golf Clubs things and Discount Golf Clubs. Nice and useful information about Cruisers Online Guide. I really liked it. Radiance is powered by two 34,000 hp General Electric LM2500 gas turbines (Radiance was the first gas turbine vessel built for Royal Caribbean). The engines are the same used by the DC-10 aircraft and generate electricity to power two ABB azi-pods that drive five-bladed 5.5 metres diameter propellers. When berthing, the azi-pods can turn 360 degrees if need be and these are assisted up by three 2730 hp bow thrusters. Should full astern power be required at cruising speed the pods are flicked to just 90 degrees. Radiance takes about one nautical mile to stop. The engines produce far less emissions than diesel engines and also produce steam for another 12,850 hp of electricity. Two Alpha Laval 650 tons/day evaporators and a 350 tons/day Desal reverse osmosis desalination plant provide more than enough fresh water. Two 18 square metre stabilisers extend over 7 metres from the hull amidships and fold back into the hull for berthing. 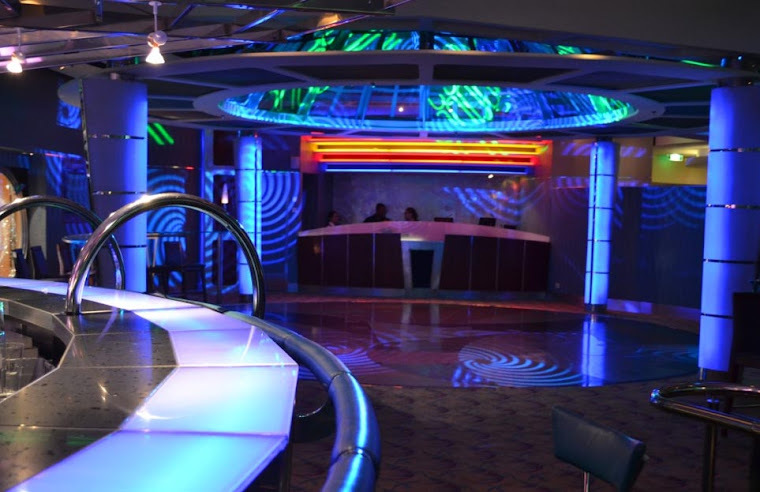 They lessen the affect of swell by up to 60% and can allow the pool tables, stabilised by a computer-controlled gyroscope, in the Colony Club on Deck 6 to remain perfectly level during a moderate swell (Radiance was the first cruise ship to have these tables installed). The Radiance being powered across the Pacific Ocean by its two 34,000 hp General Electric LM2500 gas turbines. The Centrum is the focal point of the Radiance. 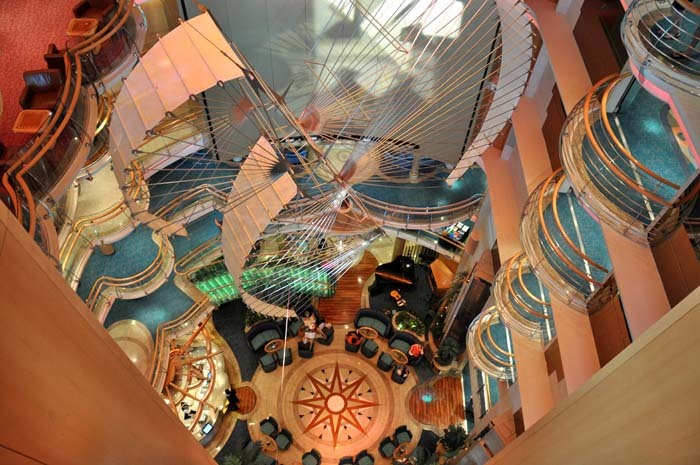 It's an atrium in the centre of the ship that runs from Deck 4 to Deck 13. 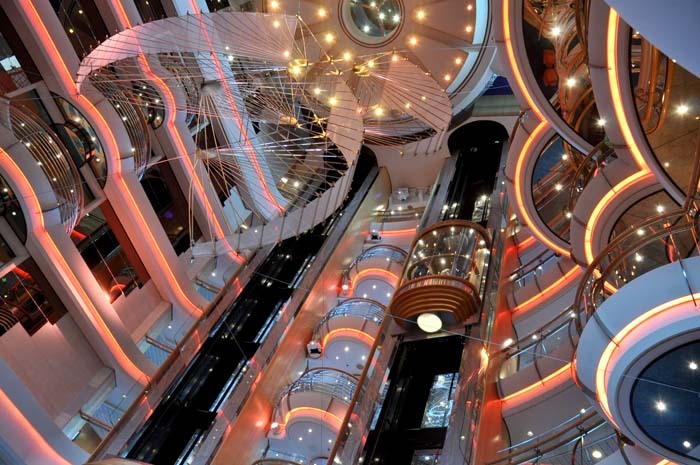 It's a spectacular space, no matter the time of day or night. 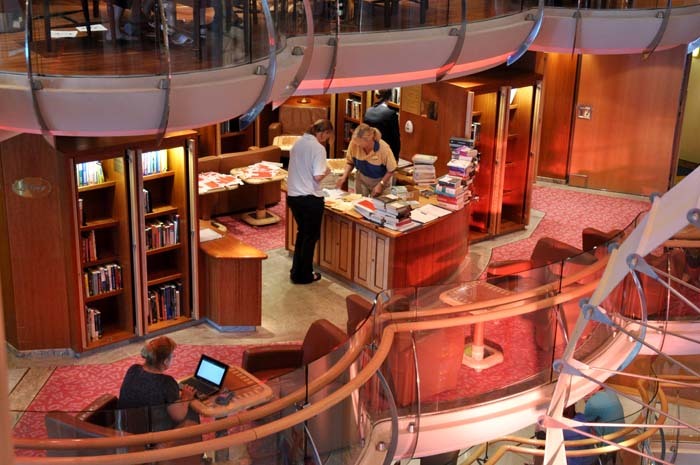 Places such as the library overlook the Centrum and the floor area at the bottom of the Centrum (Deck 4) is a well-used area. If there is an event in this area, it allows people on other levels a birds-eye view of proceedings. 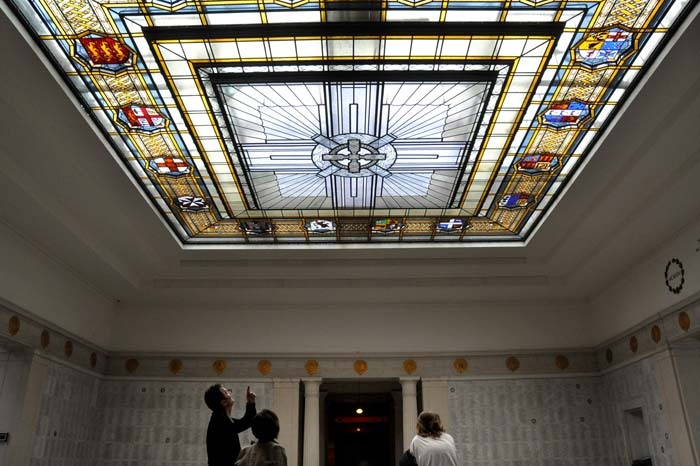 Two glass lifts/elevators also make their way up and down the inside of the Centrum. 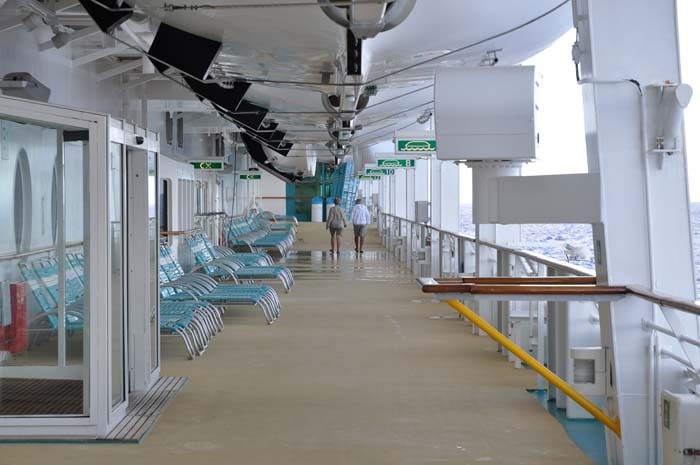 As well as these lifts, there are two glass lifts on the 'outside' of the ship that aren't specifically a part of the Centrum but are...kind of - and, sorry, way too hard to photograph but imagine a glass lift, inside a massive glass wall with spectacular views of the ocean!!! We went up and down in one the day we got on board but then took the stairs the rest of the time (we had to try and work off all that good food we ate somehow!...more on all the good food available later). 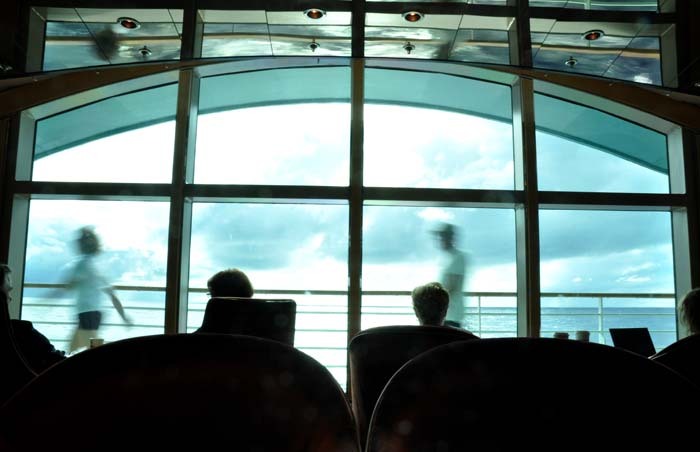 You are given your sea pass when you check in at the port before boarding. 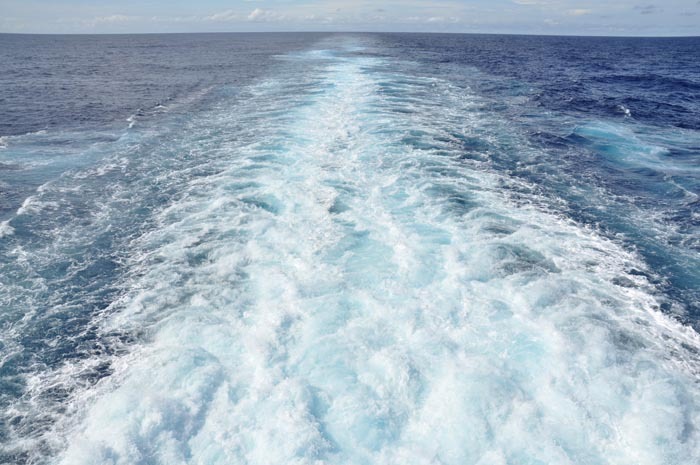 Once you are on board, you don't need anything other than your sea pass. It acts as your room key and your wallet (currency on board is $US). 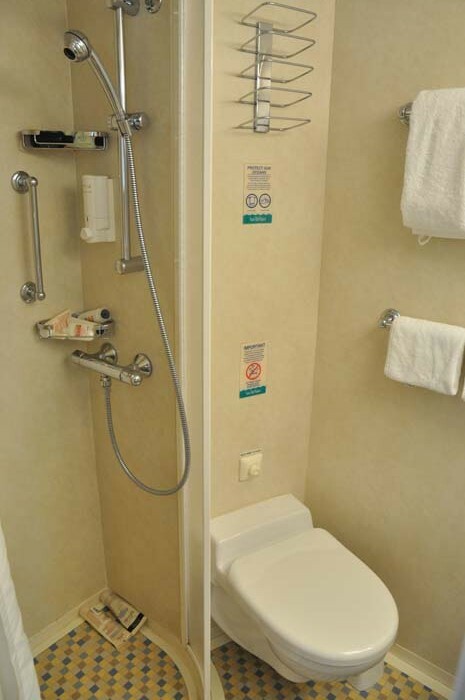 You'll feel naked leaving your room and will invariably keep checking your pockets for keys and wallet each time you walk out your stateroom door. When we checked-in we were only given the seapass. Initially we kept it in our pocket or wallet but this wasn't always 'satisfactory' (things have a habit of falling out of pockets and wallets). We kept seeing people with the seapass on the lanyard and thought 'that's a good idea'. Nat asked someone and they said they'd bought the lanyard in the onboard shop and the guest services desk punched a hole in it so they could clip it onto the lanyard. Sure enough, we bought a lanyard ($4.95) each, got a hole punched in it etc and spent the cruise with it around our neck. The other good thing was the bottom part of the lanyard can unclip, so you could take the seapass off if you needed to hand it over to pay for drinks etc and then clip it back on. It seemed everyone cottoned on to the fact this was 'the way to go' and the seapass 'necklace' was a very common sight. 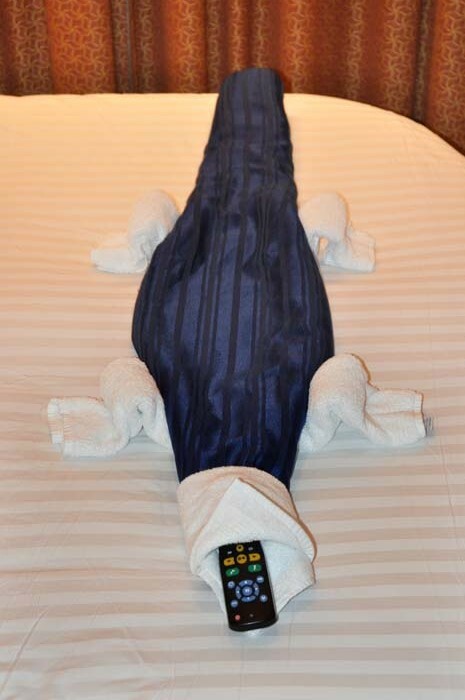 It would be good if Royal Caribbean included the lanyard with the seapass and they may do this but, unless things have changed, you can either bring your own lanyard or buy one onboard. 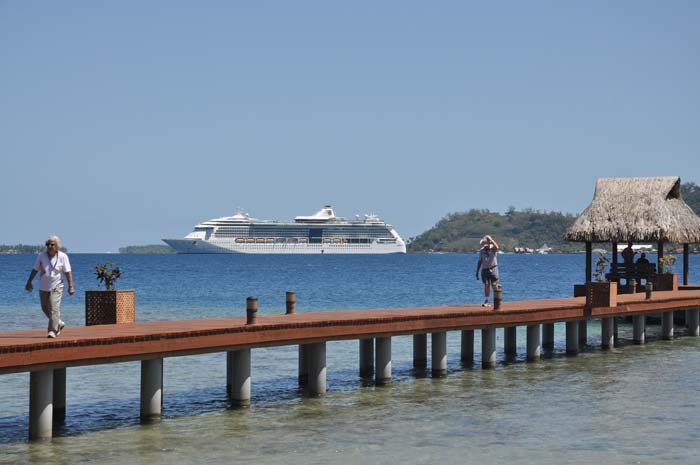 When it comes to gratuities, you can either pre-pay with your fare or you can pay a sum at the end of the cruise calculated on guidelines recommended by Royal Caribbean. 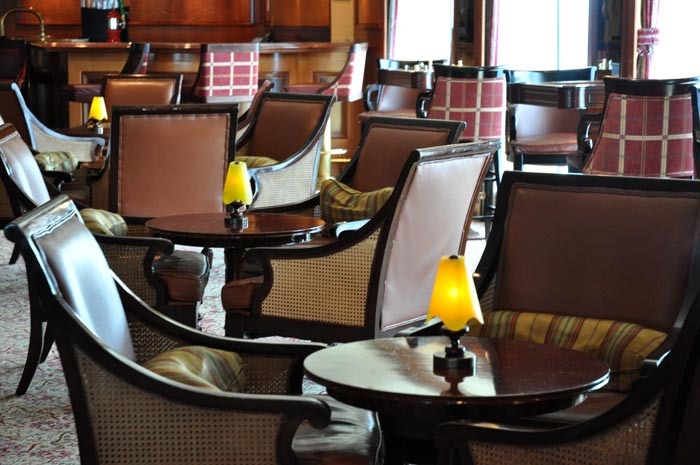 You can also pay 'additionl' gratuities as you go if you think the service warrants it. We pre-paid and liked the fact it was taken care of and we didn't have to worry about it. You can pre-order water, soda and wine packages. However, the day we boarded they were offering the same deals. We bought a 16-bottle (1 litre/1 quart) water package for $54 each. The 'as many refills as you like' soda package, which includes a re-usable 'drink bottle', for an adult cost $124 (from memory, kids package cost $79), and the wine packages started at around $28 a bottle (to buy a bottle in the dining room or on room service started at around $32). We had a Deluxe Ocean View Stateroom. It was a good sized room which was more than ample for our 17-night stay. It also had a private balcony (with, understandably, spectacular view) and small sitting area/sofa in the cabin. 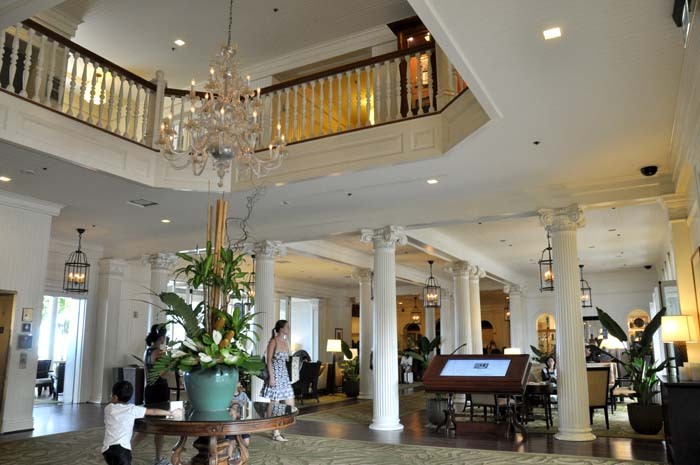 It had twin beds that had been converted into a queen-size bed that was not only extremely comfortable but very wide - almost king-size width - and a private bathroom that was quite roomy, all things considered. The total area of the room was 16.6 sq. m. (179 sq. ft.) and the balcony was 3.8 sq. m (41 sq. ft.). The other thing that really stood out was the storage space which was better than alot of hotel rooms (see photos). This meant we could unpack everything and settle in (the same could be said for bathroom storage). We didn't feel cramped - a good thing, considering the length of the cruise. The TV was a flatscreen on an arm that could be swivelled so you could watch it anywhere in the room. The room had a curtain that could separate the room into two so, feasibly, someone could watch TV while someone slept or read in bed. There were quite a few channels but, because a lot of our cruise was spent in the middle of the Pacific Ocean, this meant no satellite coverage. When the coverage dropped out the channels went onto a loop. *E - which had celebrity documentaries and 'Keeping up with the Kardashians'. *Several movie channels including TCM (Turner Classic Movies) and many channels with non-English versions of the movies showing. 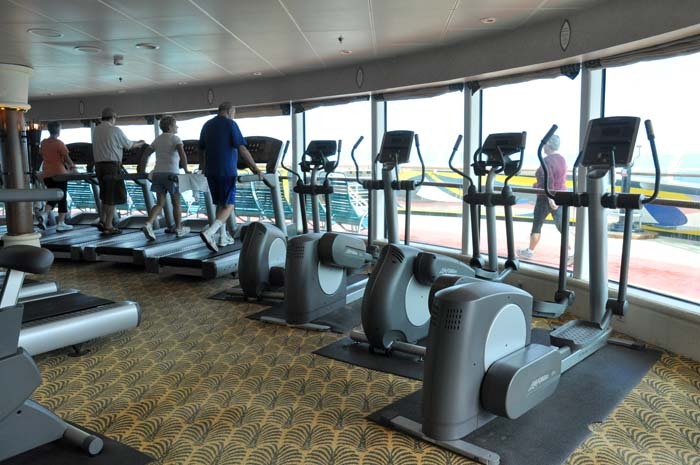 *Inhouse Radiance of the Seas channel - Each morning the Activities Manager and Cruise Director ran through the goings on for the day. We often woke and turned this on to see what was happening that day (the same 20 or so minute 'show' repeated continually until around 11am). They also talked about things such as upcoming ports of call and the customs requirements etc. It was the inhouse info channel. 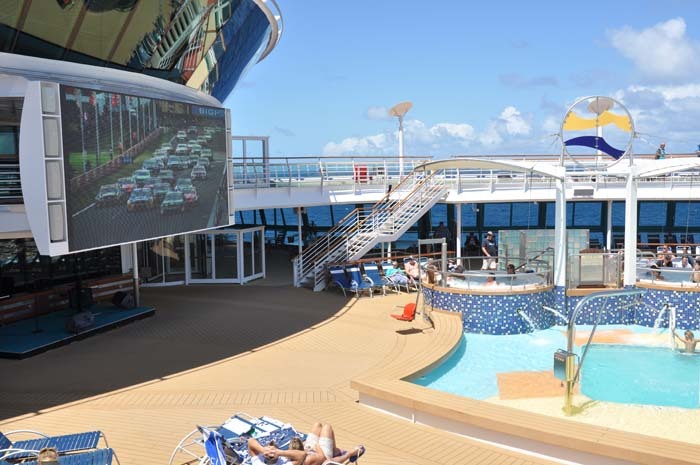 *'Excursions' channel which showed what excurisions were available for that cruise. Ship info - that showed stuff like how far the ship was from its destination, how deep the ocean was, what time the sunrise/sunset was, speed, actual compass position. We were at sea during the Rugby World Cup so, because satellite coverage was unavailable, they managed to transmit the games being streamed online. There was some buffering which meant there was about a minute of action then 20-30 seconds of buffering. The coverage was a bit stilted but better than nothing. 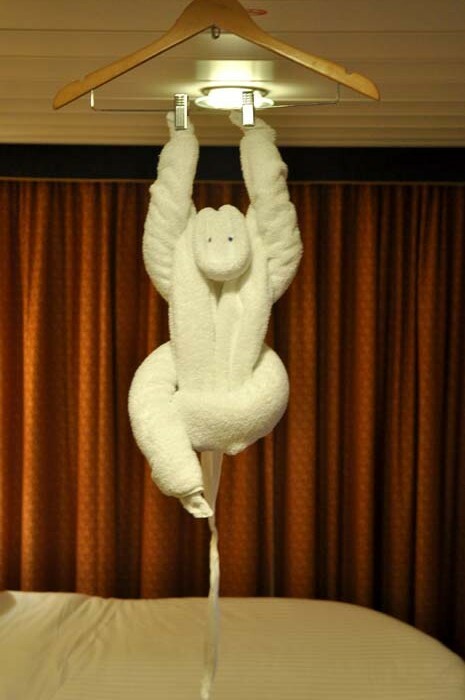 One nice little touch that occurred most evenings when we returned after a night out was the 'towel sculptures/figures' left by Solomon, our stateroom attendant (the photos below best describe what we're talking about). 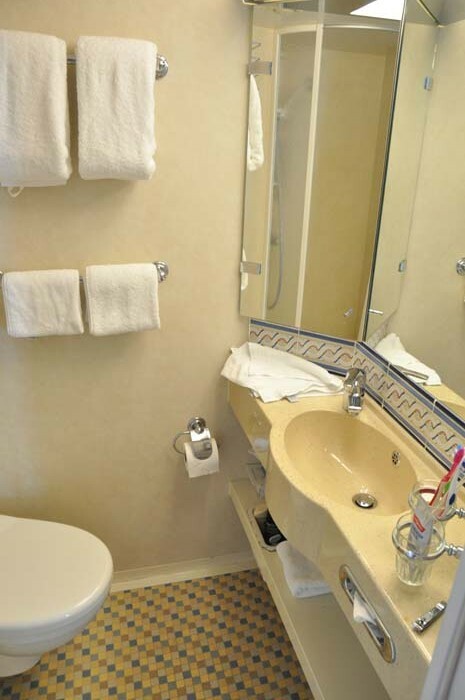 Our Stateroom - 16.6 sq. m. (179 sq. ft.). 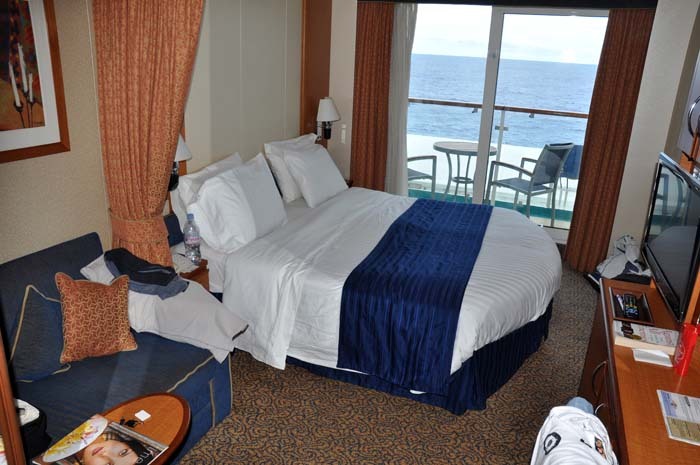 Our stateroom with the balcony and beyond. The balcony - 3.8 sq. m (41 sq. ft.). 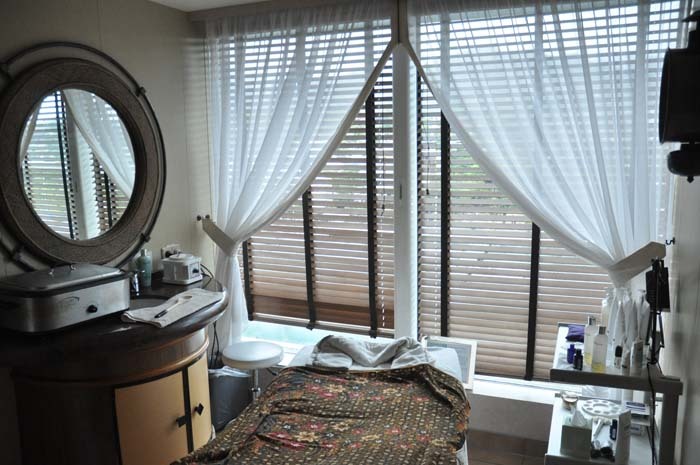 The curtain cut the room in two so someone could watch TV from the small sofa while someone read in bed or slept. 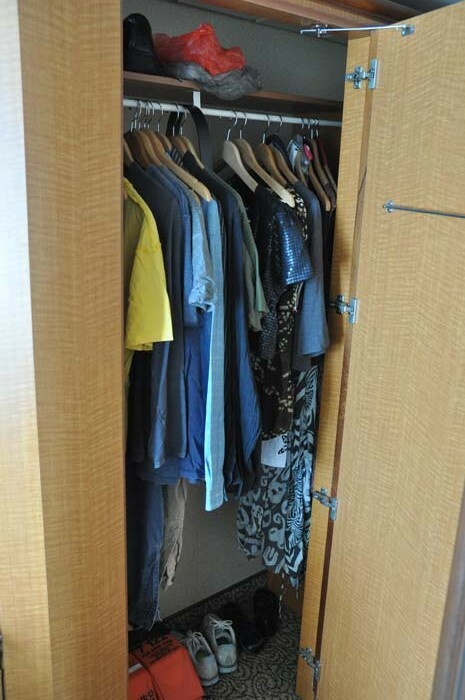 The wardrobe - plenty of space. At the back of the Windjammer was where we had breakfast most mornings. Dinner - Main seating 6pm, Second sitting 8.30pm, or My Time Dining (see below) from 5.30pm - 9.30pm. The food was fantastic - not just 'chicken or beef'. This was a la carte on the high seas. We mainly ate there at dinner and on offer were, among others, kangaroo, duck, tiger prawns, curries and soups, always served with a great selection of bread rolls. And the same applied for desserts i.e. great selection. 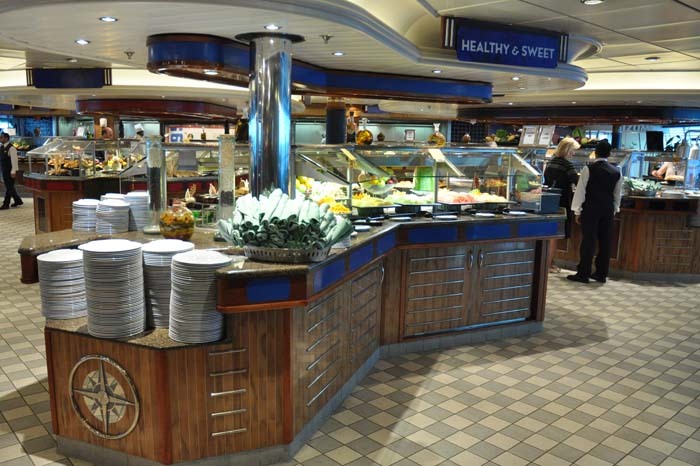 And you weren't limited to one meal - if you liked your main and wanted another, or you wanted to try more than one dessert, you could go right ahead and order more (in fact, this applies to every eatery/restaurant on the ship). 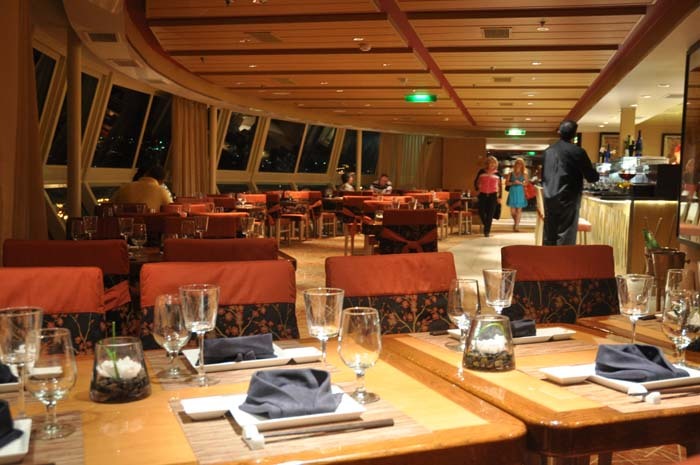 You can choose a set time to have dinner each night and are assigned that table for the cruise, with the same people at that table each night, or you can choose 'My Time' dining. This gives you the chance to ring each day and book a time for your dinner. Or you don't have to, you can eat at one of the other restaurants. My Time is more about flexibility. Cascades Dining Room (it's the same looking to the left). 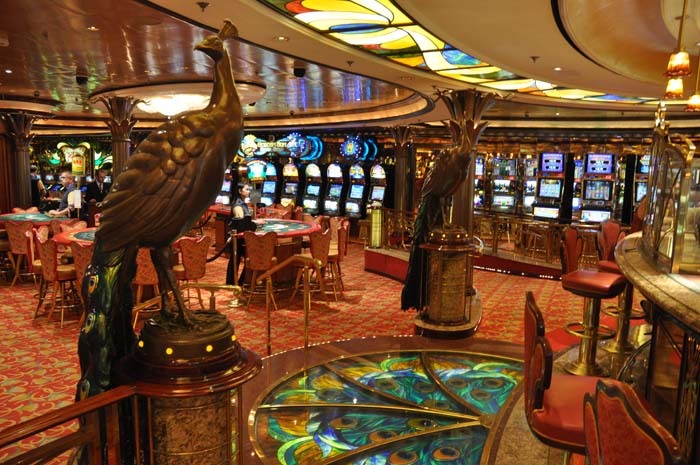 This was located in the Solarium on Deck 11. A buffet-style cafe...some of what was on offer - breakfast rolls, pastries, soups, carvery, sandwiches/rolls, salad bar, crisps (chips), whole fruit, and tea/coffee/hot chocolate/soft drinks (sodas). Free hotdogs - Sicilian, Coney Island Dog, Big Apple, Warsaw, Wunderdog, Smoke House, German Thuringia Bratwurst - on a selection of buns. 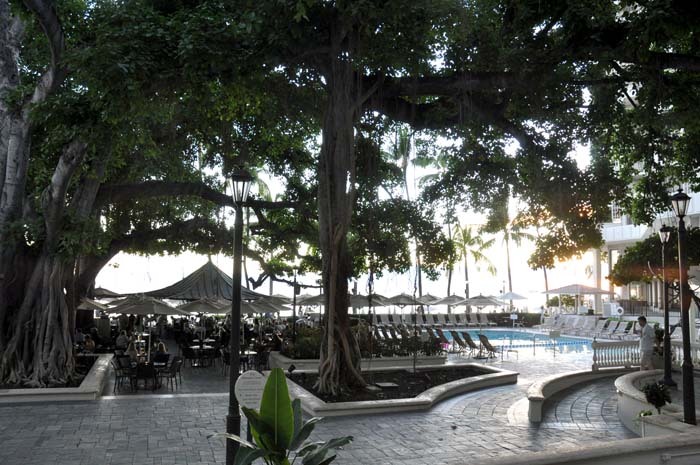 Radiance has specialty restaurants that you had to 'pay' for (menus where available). A one-off $30 per person 'dining fee' that covers everything on the menu. We both had steak the night we ate there and they were among the best steaks we've had anywhere. 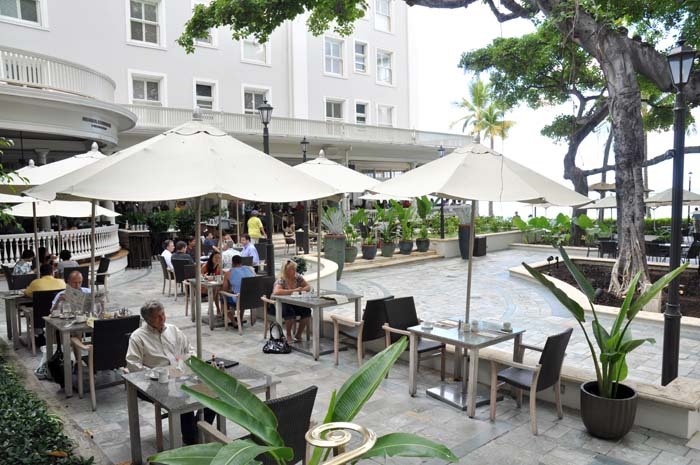 A one-off $25 per person 'dining fee' that covers everything on the menu. It's meat, meat, meat at Samba. Best to have a small lunch the day you go to Samba, as they (the 'gaucho') brings 9 cuts of meat to your table on large skewers, which he slices off in, thankfully, small portions (you don't have to have all of them). There is a small salad bar there but keep it to a minimum, you'll need the room. 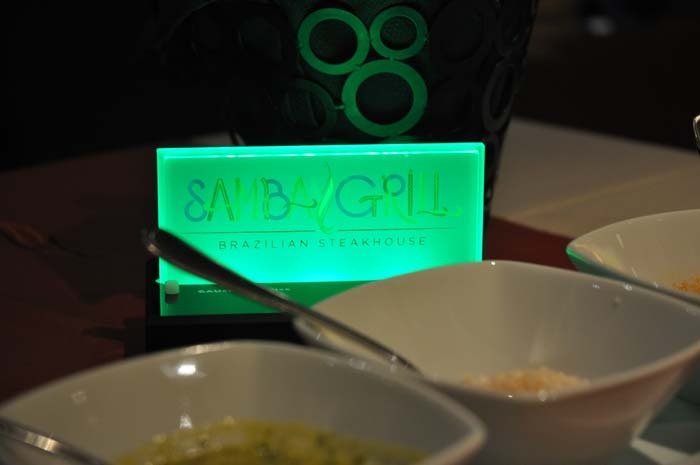 Each table has a small 'Samba Grill' sign that lights up green, red and white. 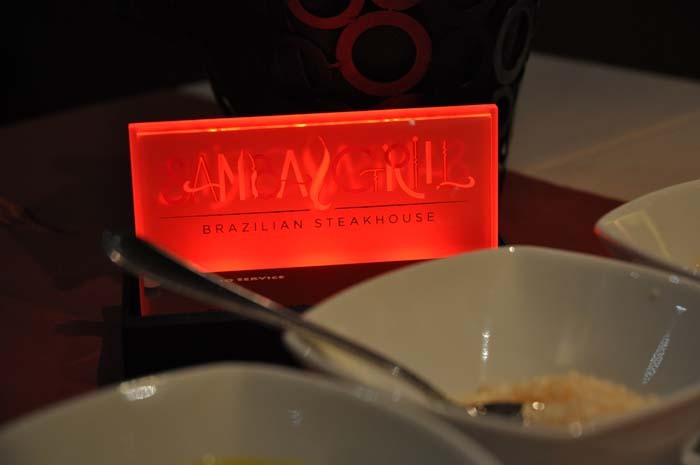 When you're ready for meat, you press the button on the sign and that will bring the gaucho to your table. When you want a break (to digest) turn the light to red and they stay away. Then, when you're ready, flick it to green and away you go again. Then, when you're ready for dessert, turn the sign to white and away you go! Green light - bring it on, we're hungry! Red light...hold off, we need a break from the steak! A one-off $20 per person 'dining fee' that covers everything on the menu. 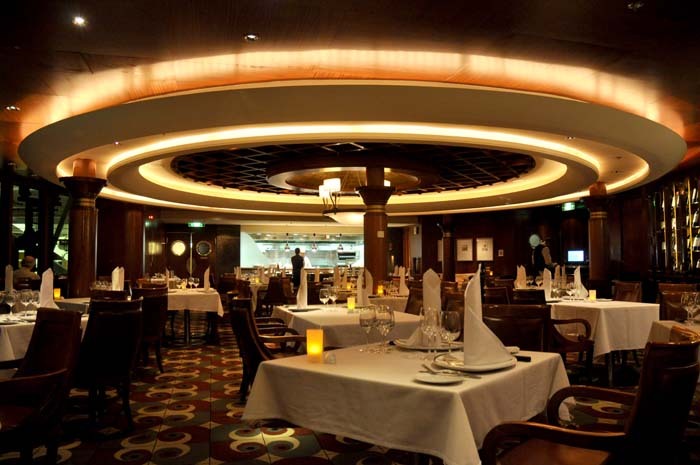 Like all the restaurants/eateries onboard, the food at Giovanni's was fabulous. However, the night we were there they were keen for us to try a 'taste' of everything on the menu. This added up to way too much food. We'd looked at the menu and had decided what we wanted but they kept bringing food and by the end of the starter 'tastes' we were just about full. Rather than move on to the tastes of the rest of the menu we had to stop them and tell them we were too full and wanted to order something. Despite all this, the food was great. A $3 dining fee but you also pay per dish, although the prices are very cheap: $4-$5 per main and cheaper for starters. Good size serves so make sure you go in hungry. We couldn't understand why you have to pay $3 at the door and then pay for food, albeit at cheap prices. Why not just pay a one-off $10 or $15 fee and be done with it, or add $1 to everything on the menu? It seems odd to 'double-dip' this way. 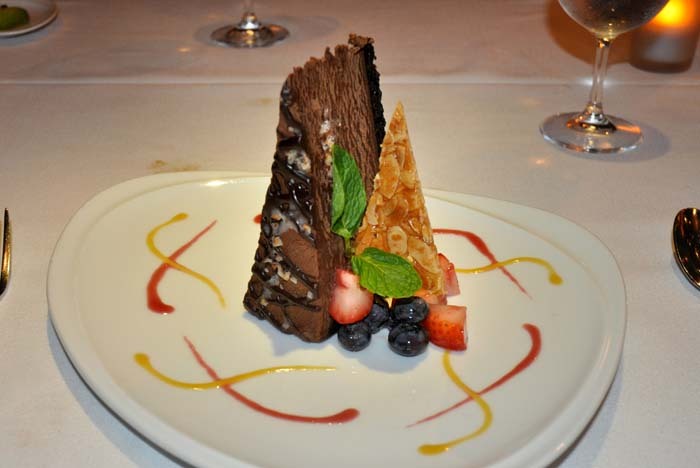 Still, the food was fabulous and we saw a spectacular sunset as we were perched over the ocean. Rita's also had a happy hour between 6.30pm and 7.30pm with great margaritas - buy 2, get one free. 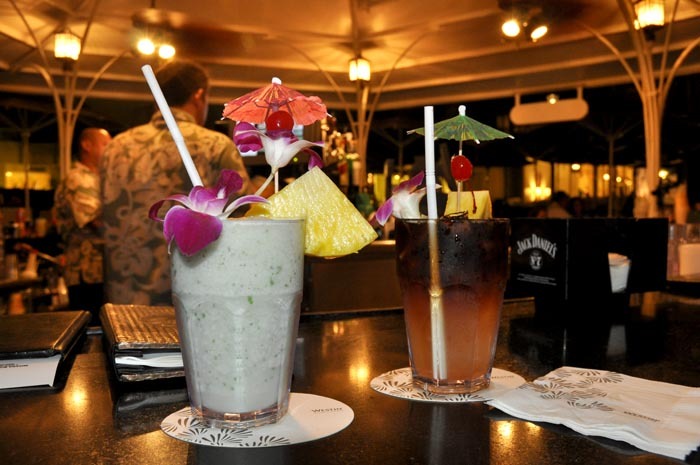 Like all alcohol on board, you had to pay for these, about $7 each. Like Rita's Cantina, there was a dining fee - this time $5 - and you also pay per dish, up to $10 per main and cheaper for starters. Once again, why not just pay a one-off fee and be done with it, or add a bit more to everything on the menu? 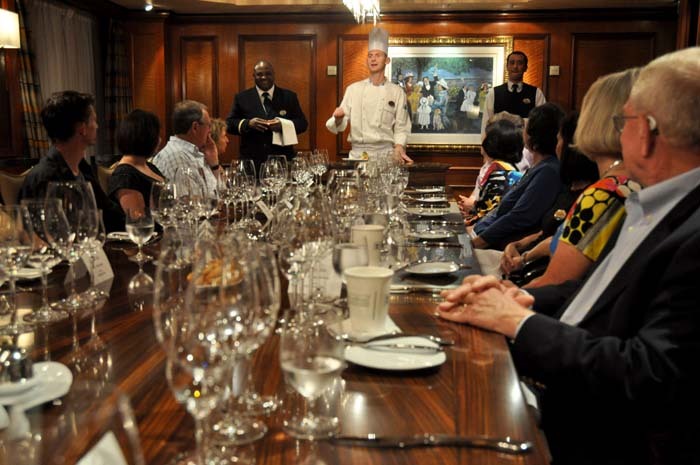 The Chef's Table was one of the highlights of the cruise. It's a five course dinner with wines to match and it $90 per person but it's also a real event. It started the day before the dinner when a small note was left in the room reminding us our booking was for the following night and that we should meet in the Champagne Bar at 6.30pm for complimentary champagne before moving on to the Chef's Table dining room. After 'bubbles' in the Champagne Bar we were met and accompanied to the dining room, where place names greeted us. At one end of the beautifully set table was a small, raised counter. After we all sat down, Sous Chef Richard Henry, Sommelier Ioan Clipici and the maitre d' (sorry, can't remember name) stood at the counter and welcomed us. The purpose of the counter became evident when Richard brought out each dish and explained it to us, during which time we could ask questions. Ioan then explained each wine that was to accompany the meal. This was a great chance for us all to chat and get to know one another and all three of our 'hosts' joked and made us all feel a part of the evening. Everything about the night was top class - Lobster and Alaskan King Crab Leg Salad, Pear-grapefruit slaw, citrus dressing and micro greens, being one of the dishes. And it was silver service the whole way. At the end of the evening we were all presented with the menu and seating plan of the evening, as well as a cookbook put out by Royal Caribbean (top quality publication) and a Chef's Table apron each. Sous Chef, Richard Henry, Sommelier, Ioan Clipici (right) and maitre d' (sorry, can't remember name) chat to us all at the 'counter' at the end of the table. Richard joins us at the table. 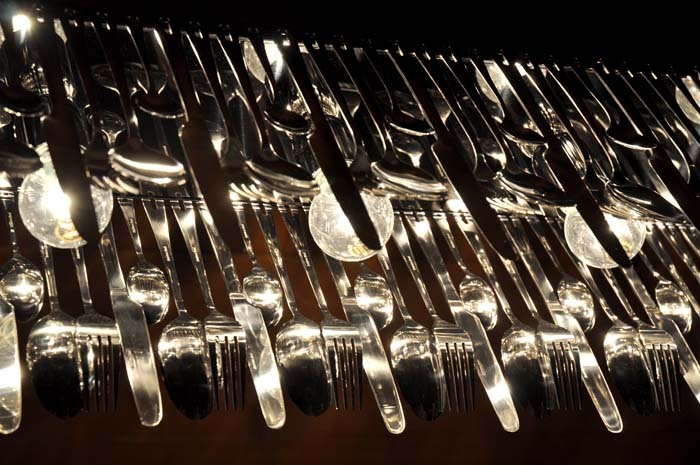 The 'light shade' in the Chef's Table dining room - made of cutlery. Room service is free, except for alcohol. It's a somewhat limited menu but, considering you're not going to be spending a ton of time in your room and there is so much good food elsewhere 18 hours a day, it isn't bad (there is a $3.95 delivery fee between midnight and 5am). 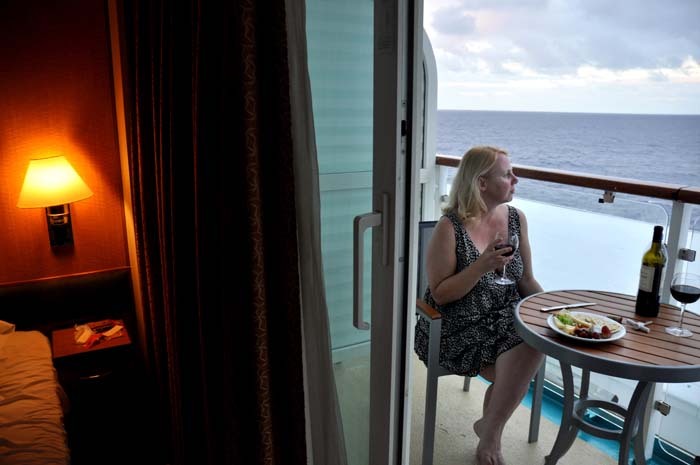 We ordered the cheese plate and a bottle of wine on several occasions and watched the sunset on the balcony, and even had other people we'd met on the cruise over for afternoon drinks and cheese (we ordered a few plates) on the balcony. We also had breakfast delivered on a couple of occasions (when we were going to be in a port-of-call and had an early start) and the food was great - especially the basket of pastries! Lots of places to get a drink - alcohol, that is. Not surprising, as this is one of the ways the Radiance makes money. 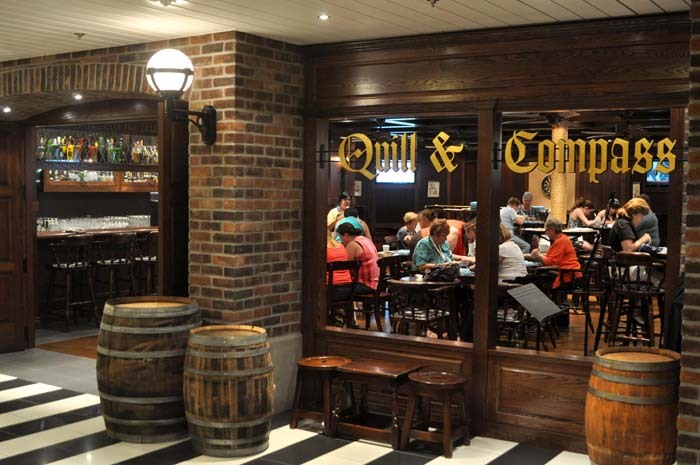 All are spectacular in their own way, even the English pub, The Quill and Compass, that was located in the middle of the ship i.e. 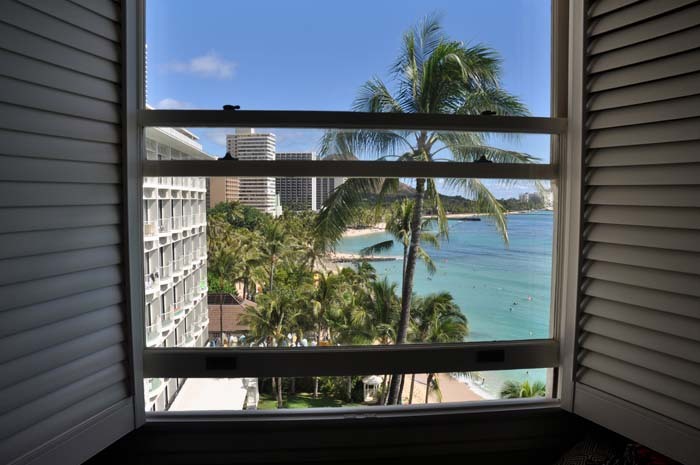 no ocean views. This actually added to pub, as there are many English pubs with ocean views. The one downside to the Quill and Compass is that the only two beers on tap were Heineken and Amstel, from Germany and Belgium repectively. They didn't have a great amount of UK beers, however they did have have, among others, Boddingtons (cans) and Newcastle Brown Ale (bottles), as well as a myriad of other beers from around the world. We were surprised how cheap cocktails were and had quite a few cocktail nights. The bar staff also free pour, instead of using nip measures, so you often got more bang for your buck (especially in cocktails). 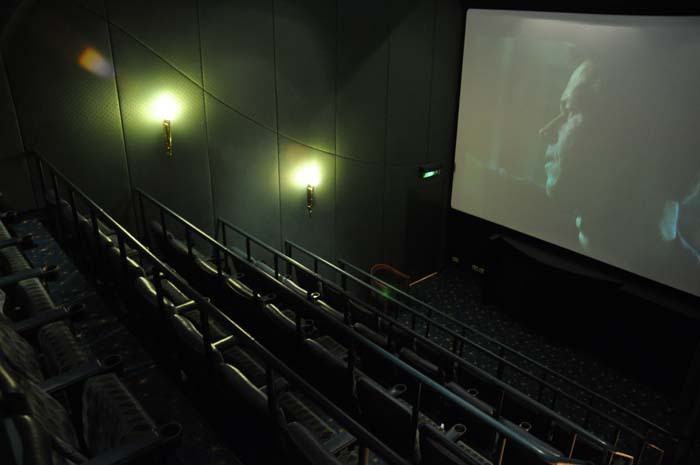 There are also bars in the Aurora Theatre, Casino Royale and the Solarium. 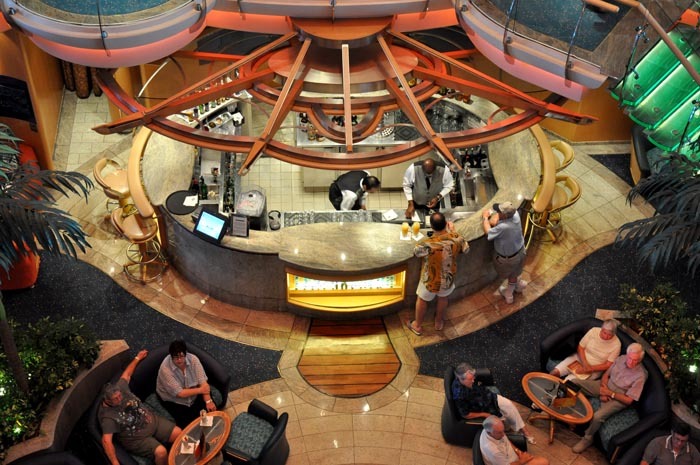 There is a limited bar in Windjammers and a full bar in Cascades dining room, where you can also buy a bottle of wine and, if you don't finish it, they will hold it for you until the next time you are there for dinner. 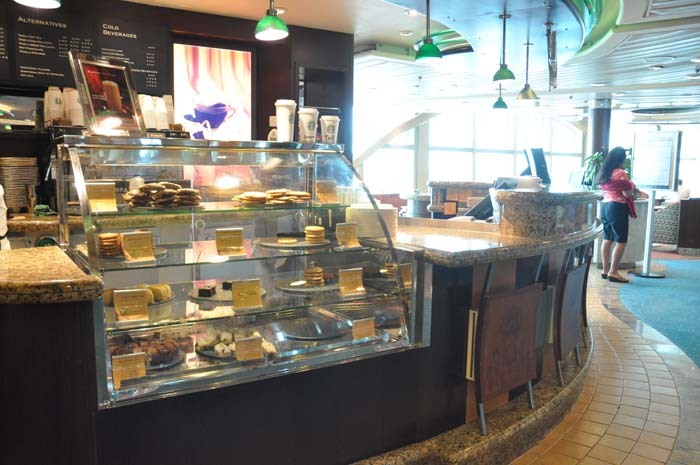 While it's possible to get filtered coffee everywhere, there is only one place on board where you get your cafe latte, cappuccino, cafe mocha or the like - and that's at Latte-tudes. And they have a good selection of pastries/cookies/cakes. We overpacked. It seems you always overpack. Such is life. 1 long sleeve cardigan - worth it at night! I didn't count my underwear :) but took more than enough! We would wash every 3 or 4 days - so best to work out what you need for that. 2 dresses - I packed 4 and didn't touch them all - formal nights are so spread out that even 1 dress will do. Hosiery - or not if you visit the spa/ get a great tan or it's too hot! 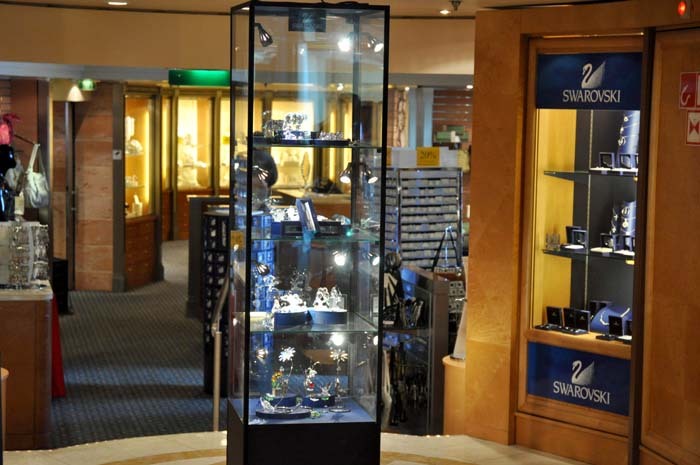 Accessories - same as the note for dresses above… you won't need as much as you think. My (Nat) biggest advice for clothes and something I will remind myself next time we take a cruise is pack half of what I think I will wear and remember I'm always going to buy something in port or on the ship so I need to leave room! 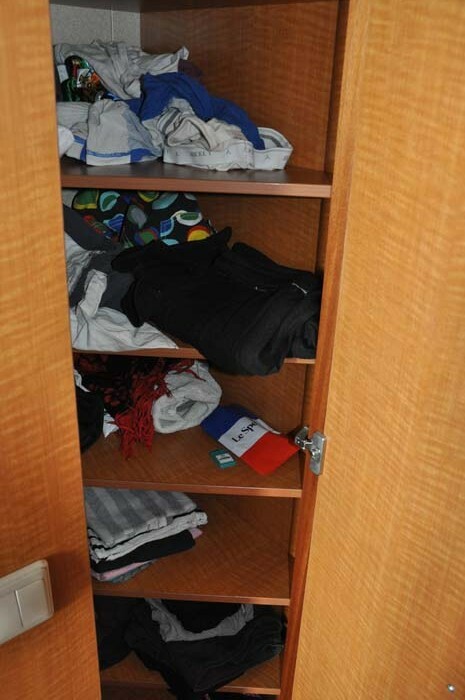 No Royal Caribbean ship has a laundry room available for passenger use, as they take the view that you are there to have a holiday and not do laundry. The laundry service they provide is fast and efficient - you leave your clothes in the laundry bag in your room, tick the service/s you want, they pick it up at night and have it back to you the following afternoon. 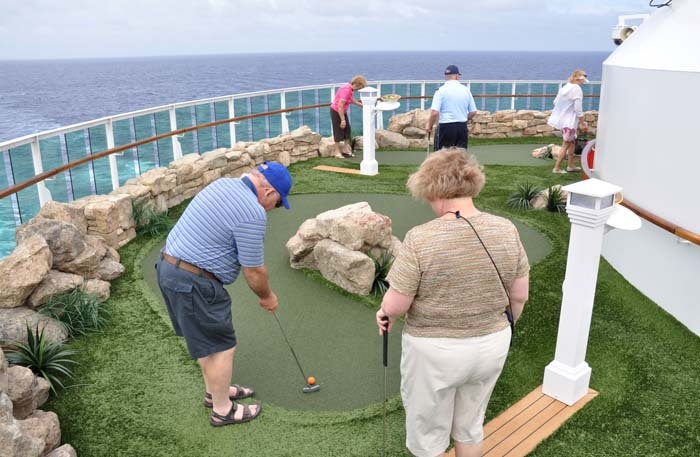 Of course, there is a fee for the service but, from our perspective, it gave us more time to relax and enjoy the cruise (and when you're there, the cost seems worth it). They also offer a 'press only' service for cheaper prices. 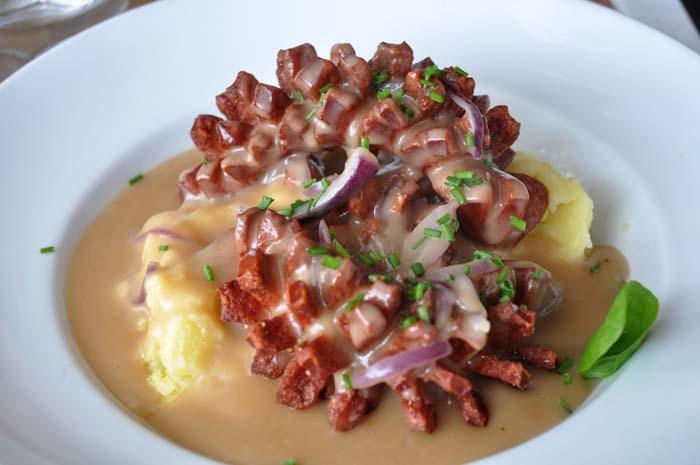 With all the fabulous food available, it is inevitable you will put on a few kilos/pounds. If you don't, well you have far stronger will power than us! However, while a few kgs/lbs might be added, there are a few ways to keep it to a minimum. 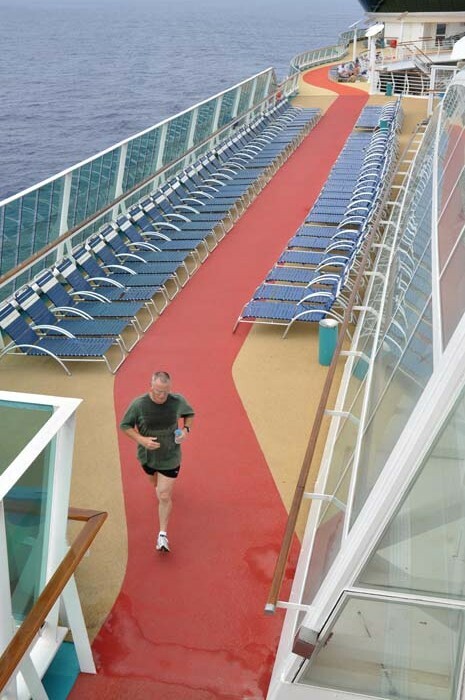 While there is a jogging track on Deck 12, most of which overlooks the swimming deck and passes by the gymnasium (one way to keep the weight gain down), we discovered that on Deck 5 you can walk all the way around the ship. One circuit is around 540 metres (600 yards). We also took the internal steps everywhere we went, despite the availability of lifts. On a good day we could do around 300+ steps. 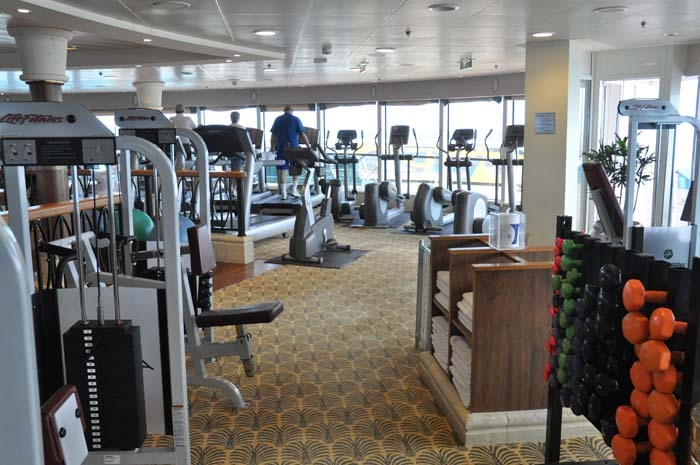 As mentioned, there is also a gym - a well equipped gym - open from 6am - 10pm. And it's free. 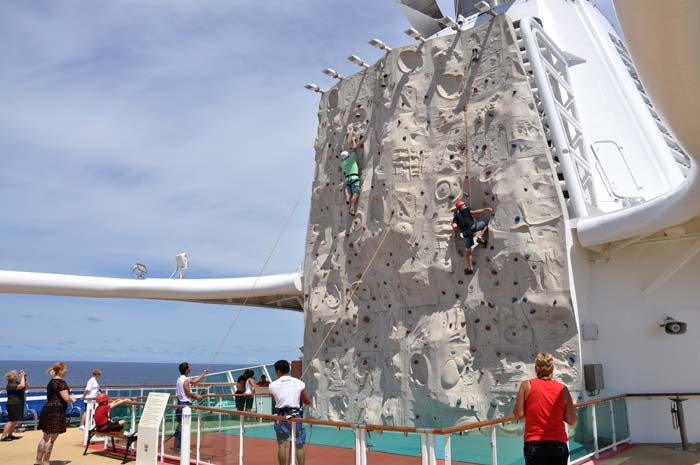 If you're keen, there is also the rock climbing wall (with spectacular views) open from 9am - 11am and 1pm - 3pm, and a basketball court that doubles as a sports court. 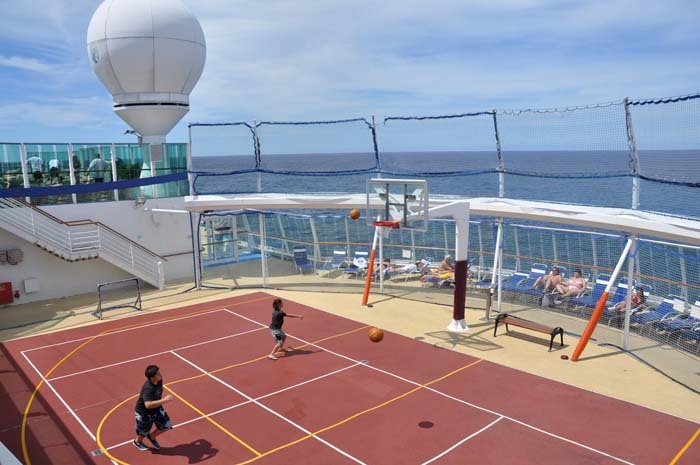 There are also soccer tournaments and other sporting contests held on the sports court (it also has spectacular views). If you feel like doing laps, albeit short ones, or treading water, there is the main pool on the pool deck or the pool in the Solarium, an under cover, adults only area just off the pool deck with a large, glass retractable roof (which is rarely retracted). The rock climbing wall - a great view! 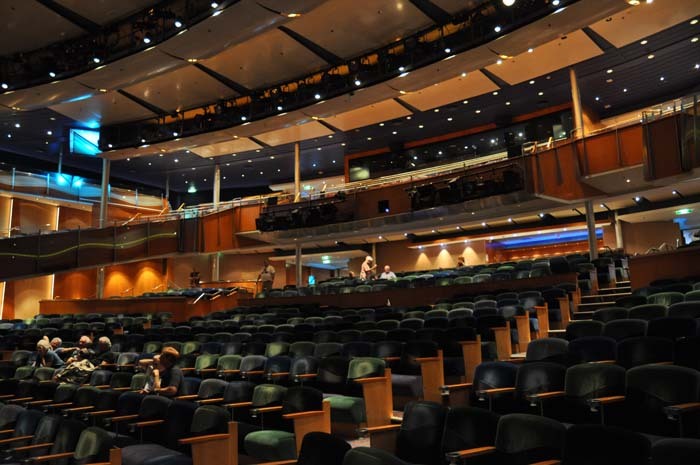 Aurora Theatre - seats over 800 people with a lower level and a large balcony. The live theatre acts perform there every night and during the day there are things such as guest lectures. 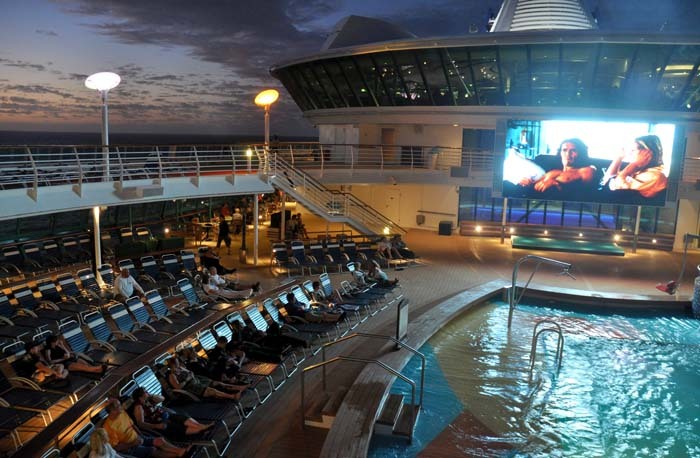 Big screen on the pool deck - used both day and night (twilight movies). Starquest nightclub/disco - open until the wee hours and it got pumping late into the night. Mini-golf - not a great mini-golf course but the great views make up for it. Cinema - seats around 60 and they have the movies on a loop, so early on in the cruise the cinema is quite full but tapers off. Casino Royale - one good thing about the casino is that it isn't open 24 hours. It shuts around 2am and reopens at 10am. 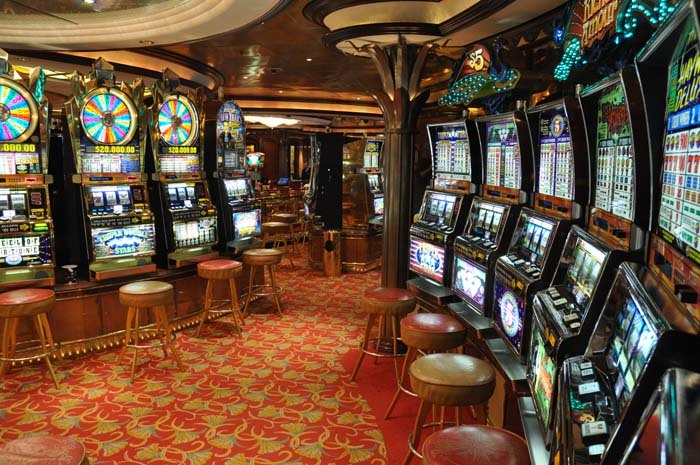 There is a bar and all the obligatory games...pokies (slot machines), roulette, craps, black jack, poker. Library - a small but well stocked library overlooking the centrum. A nice space where you can sit and read or pick up a book (no more than 2 books at a time can be loaned). 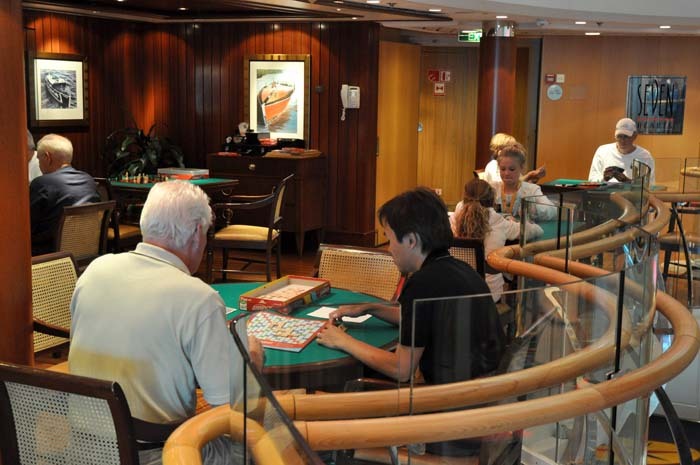 Seven Hearts - overlooking the centrum, where you can play cards on the several card tables (with green felt tops) or choose from a selection of board games which you are more than welcome to take anywhere on the ship. The pool deck - another space well used. A duet performed there daily but there were also events such as the 'crossing of the equator' ceremony and 'hula lessons'. The Centrum (floor/lobby area) - the Centrum is often used for all sorts of things, from cooking displays to themed dance nights. 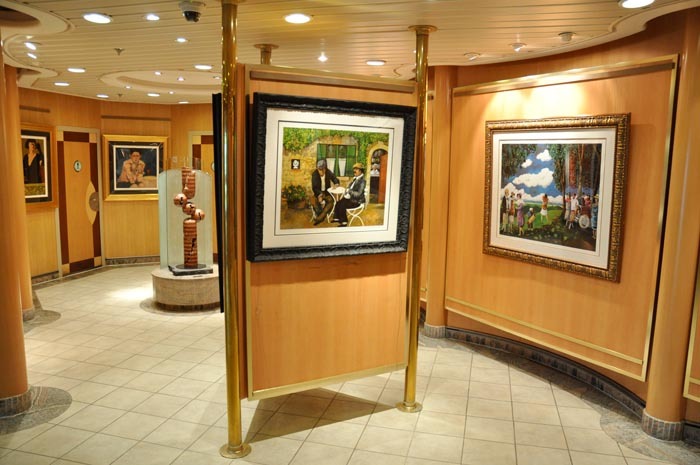 Art auctions - you can even buy art while on the high seas, if that's your cup of tea and you brought the cheque book/credit card (not sure if you can put it on your sea pass). And there are some good works up for grabs. We're not art experts but one piece went for over $3,000 the day we wandered in and had a look (auctions aren't held every day). The kids have a whole area to themselves. In fact, we hardly even knew there were kids on the ship because they were all off doing kids stuff and being entertained. There's the 'Royal Baby & Tots' area (http://bit.ly/tjaF63), Challenger's Arcade, with video and arcade games, and the Adventure Ocean for 'kids and teens' that offers art, individual and team sports, performance and generally a fun time for all (http://bit.ly/tvYqVA). 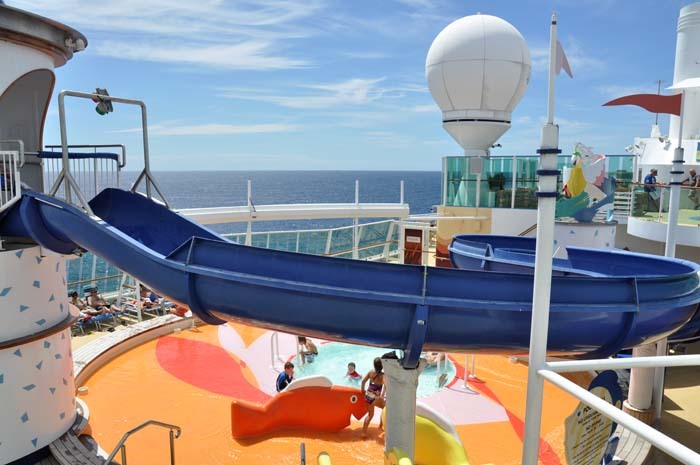 The outdoors element of the Adventure Ocean comprises a water park with a water slide and other watery fun. 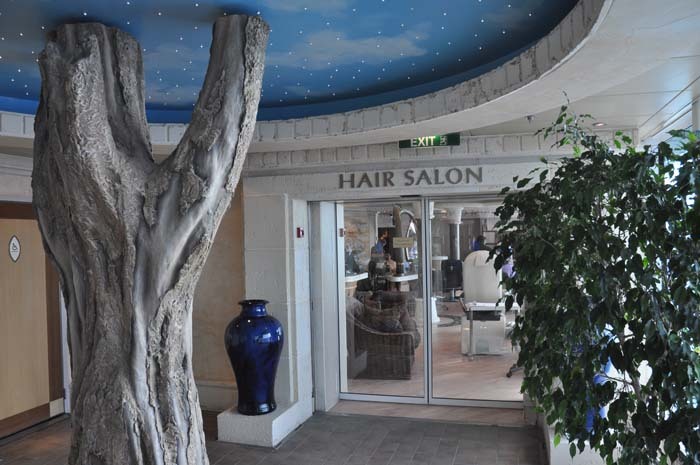 The onboard day spa is a fully outfitted day spa and offers everything you'd expect. I had a 50-minute Swedish massage that cost $119 and well worth the money. I felt totally pampered. The only downside was that a $17 gratuity was added to the cost without my knowing, so it came to $136. Nat had a colour and blow dry that came to $170. This included $50 for the blow dry and a gratuity. While neither of us check beforehand, we didn't expect the gratuity to be added. This was probably because we had paid for our gratuities up front. The day spa also has a sauna which is also available to users of the gym. 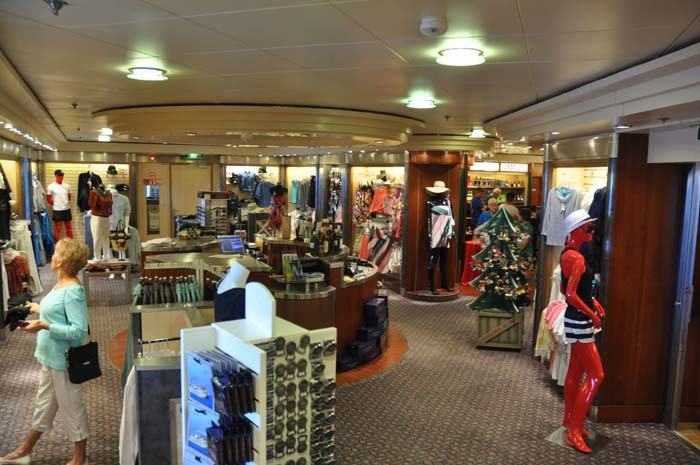 There is a general store, a jewellery shop and a duty free shop on board, all off a small shopping 'mall'. 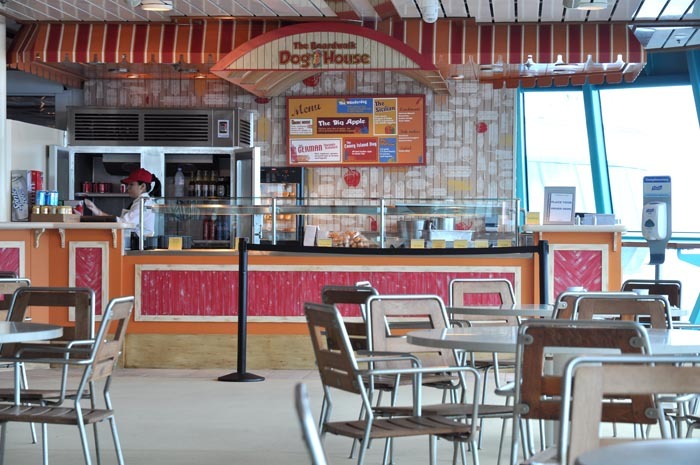 Every so often they have 'sales' in the shopping mall or in another busy part of the ship (outside the Windjammer Cafe). Nat bought a dressy type T-shirt for $24 and the general store had a few food stuffs but mainly touristy, Radiance of the Seas stuff like fridge magnets (which I bought at $4 each). It wasn't cheap but, then again, you're in the middle of the ocean (and you should be out having fun!). 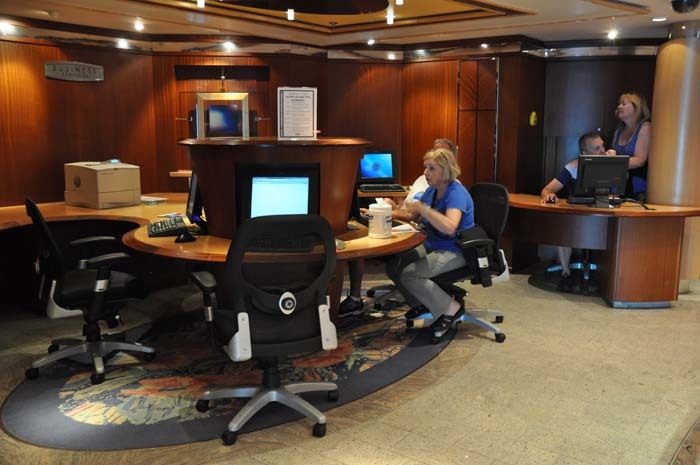 There is an internet 'cafe' and internet was also available in the business centre. Costs using these two was 65c/minute. You can take photos pretty much anywhere, even the casino. In fact, taking photos is almost encouraged! Everywhere I went, people were more than happy for me to take photos (although I made sure Nat was with me when I took a quick photo of the kids water park and the basketball court). There are onboard photographers and you will inevitably get snapped at least once. Photos are available to buy - a 25x20cm (10x8inch) photo goes for $20 and you can go all out and get the full package for $349.95 (what you get for this, I don't know). 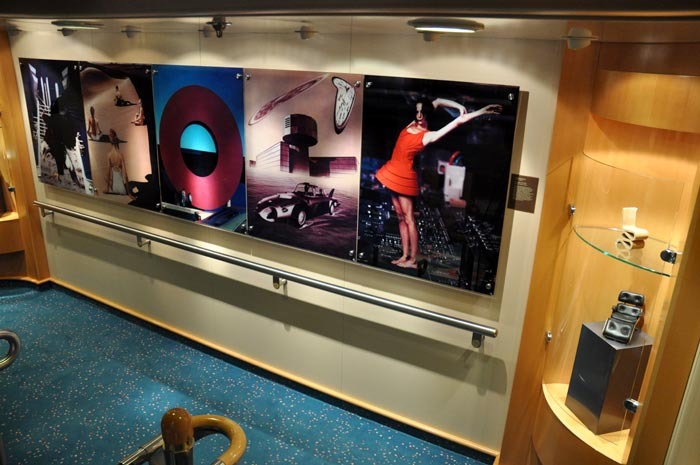 All the photos are put up in the photo lab and gallery on Deck 4. The on board photographers also set themselves up on many night (the formal nights, especially) in the Centrum and surrounds and are available to take family portraits. The up was quite impressive with full on studio flashed and backdrops. The photographers also act as videographers and film much of the cruise for the cruise DVD available for sale at the end of the cruise for $29.95. We snapped up a copy but were disappointed after viewing it when we got home. The production was pretty ordinary and it was merely a series of video 'snapshots' of passengers doing stuff (okay, you might say...isn't that the point?). However, the footage didn't have any particular flow or meaning and there were no voice-overs or text explaining what was happening. And the port of call footage was file footage and any didn't show of the passengers doing anything on the multitude of tours available where we stopped. For instance, the day we were in Papeete the weather was terrible but in the video it was beautiful and sunny - straight out of the tourist 'brochure'. 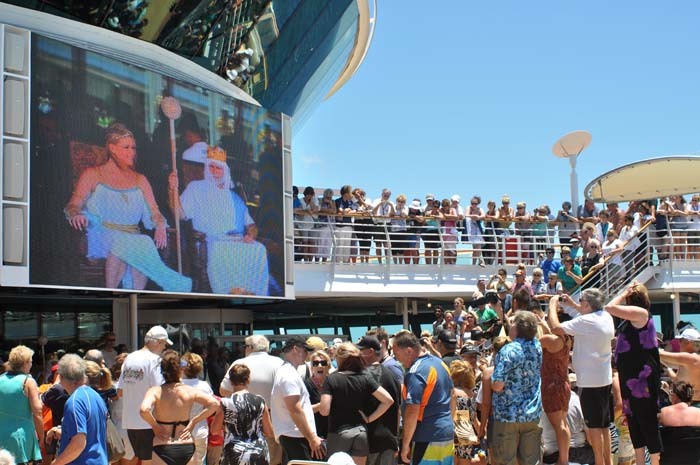 If this is your first cruise, you probably feel obligated to get the DVD but, seriously, we wouldn't have bothered (even though we did briefly appear in one clip). 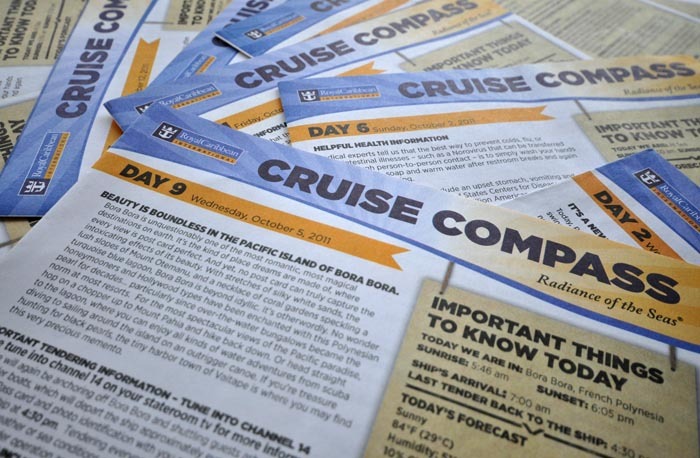 Each night the onboard newsletter, the Cruise Compass, is delivered to your stateroom (either left in your room when you were out or in the mail slip on your stateroom door). 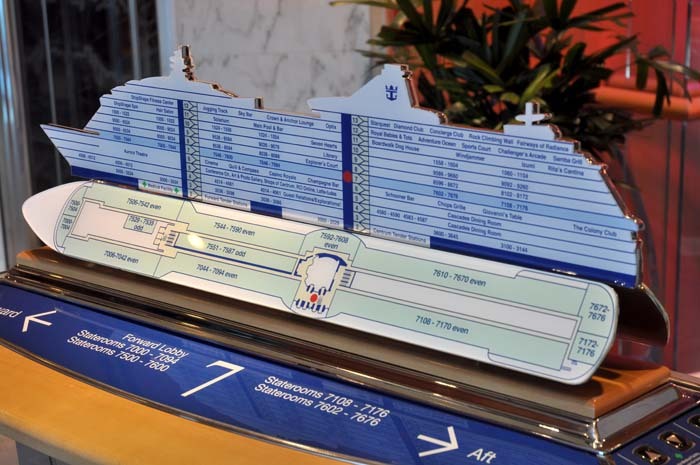 This includes a chronological, hour-by-hour list of the day/evening's activities on board, a slightly more expanded explanation of some of the activities, a reminder of the opening hours of everything on board and a few small 'features' on what was available on board, such as specials and the like. We found we used this quite alot but, even if we were without it, there were large versions of the chronological, hour-by-hour list of the day/evening's activities on boards around the ship. 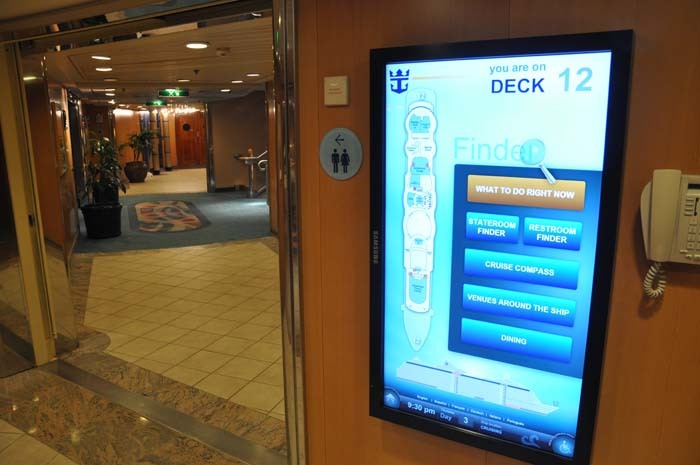 There was also scattered around the ship electronic 'Wayward Finders' that let you know what was on and when it was on. There was also non-electric Wayward Finders scattered around the ship (see photos below). 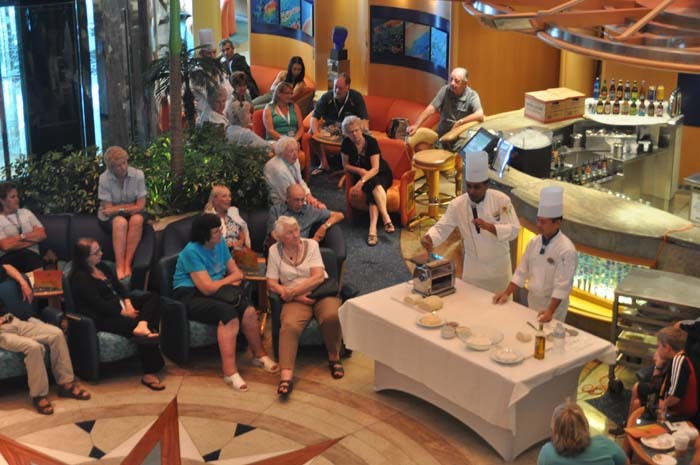 The Radiance has an on board excursions desk/service through which you can book shore excursions. 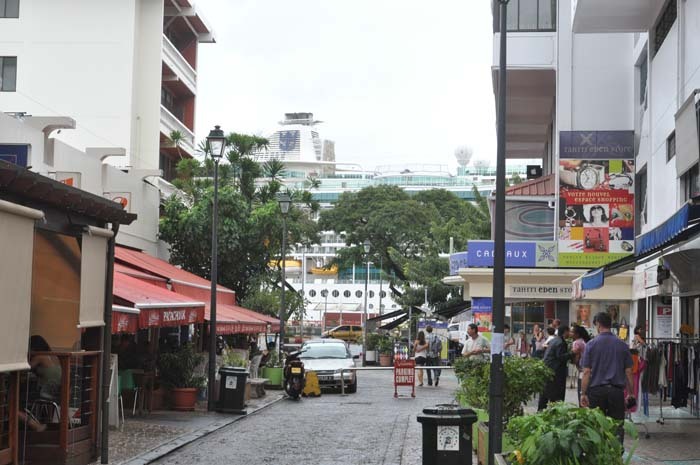 We opted to book tours ourselves on the dock of each port of call. There were advantages to both. 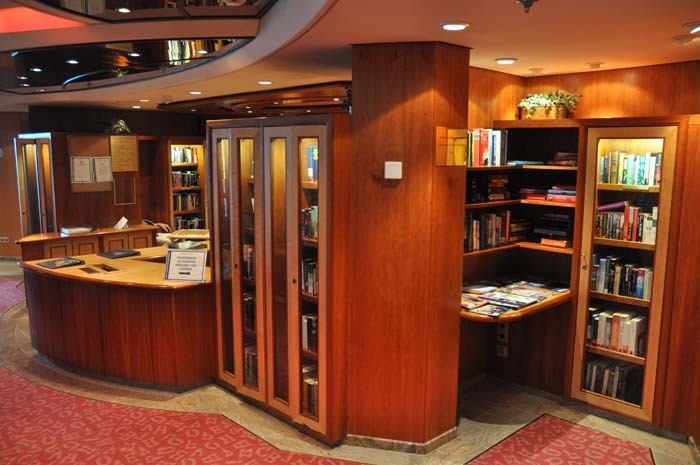 If you book a tour through the ship, they organise everything and there's no need to worry about anything. This can be an advantage when you're totally chilled from your days at sea and don't want to have to worry about anything. Also, if something goes wrong i.e. there is a delay getting back to the ship, then the ship will wait. If you 'go it alone' and something goes wrong, the ship sails without you. 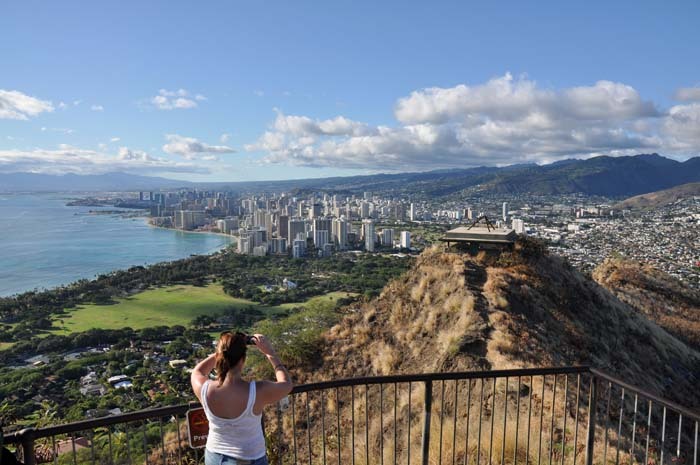 We found the advantage of booking onshore was that we could get the same tours/excursions much cheaper. 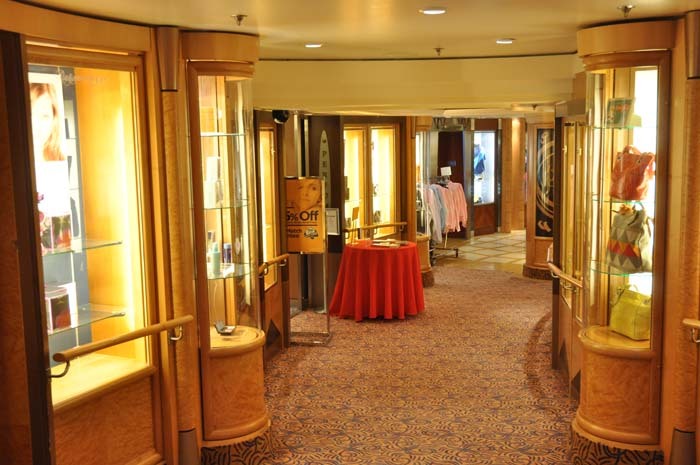 For example, on one excursion we paid $59 (on shore special) for a tour the ship was advertising as $159, and on another we paid $30 for a trip being sold on the ship for $59. 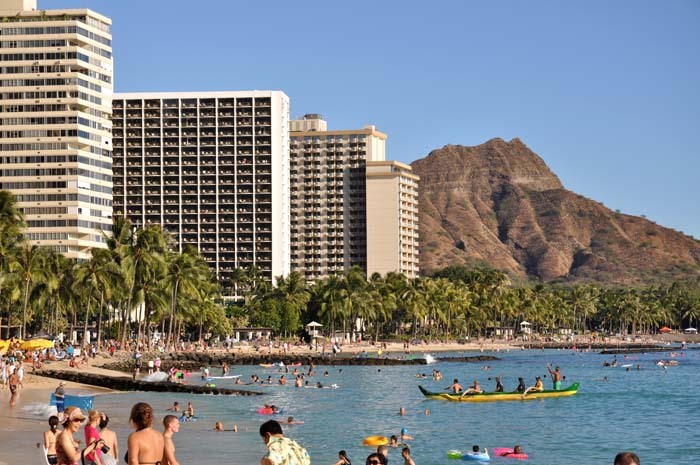 For all shore excursions, you must have your sea pass and photo ID. When the ship is moored dockside at a port-of-call, it's a simple case of walking off, and on, when you like. 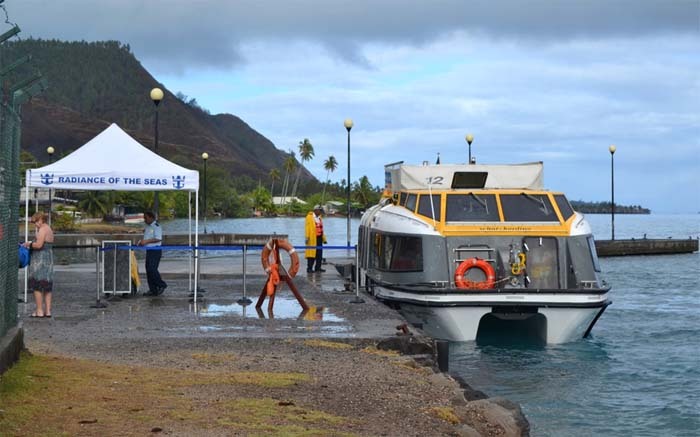 When the ship is moored offshore, the tenders are used. 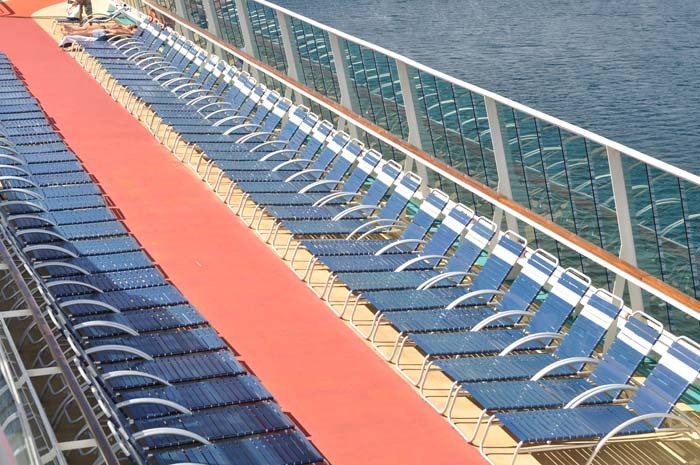 These are small boats (seat over 100) that take passengers from the ship to shore, and back. 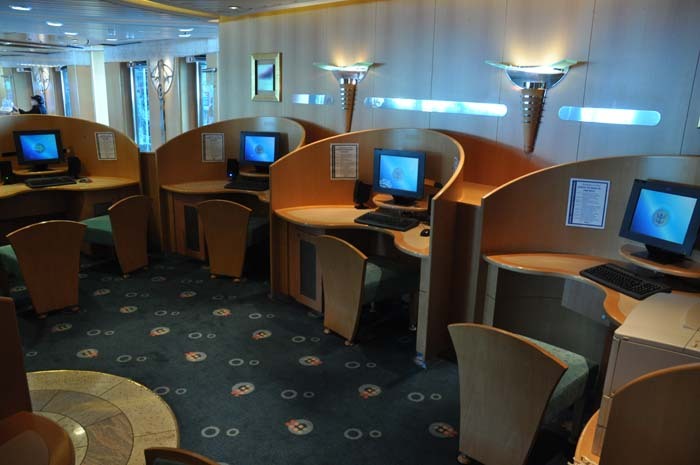 Because the tenders can't take everyone at once, those who have booked a tour through the onboard tour desk are given a tender ticket and have priority. That said, there is a window for those without tender tickets - usually from around 7am - 7.45am, or thereabouts - before the tours start, then from around 10am onwards. Coming back, it's first in, best dressed. There were 4 tenders working and they shuttled people all day, leaving the ship/shore every 15-20 minutes. 1) If you intend using your credit card while you are away, tell your credit card provider that you are going overseas, so they don't think your credit card has been compromised and someone in a foreign land has suddenly started making purchases. The last thing you want to deal with when you get home is a cancelled credit card and having to sort out all your direct debits etc when your bank sends you a new one. While it's good that credit card security works this way, it's a hassle you don't need. 2) Similarly to your credit card, contact your mobile phone provider and have your phone switched to international call roaming. The costs are very high if you do make calls but it's a security blanket should you need to use your phone in an emergency. IMPORTANT - turn off data roaming on your phone (I have no firm tips on this, as it will vary from phone to phone). While you may not make calls while you are away, any data that is uploaded or downloaded (emails or apps, for instance) will be charged at a far, far more expensive rate. 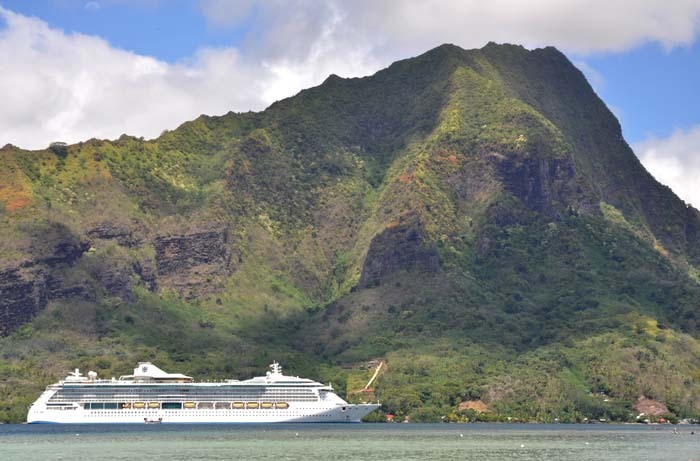 We spent two nights in Honolulu before we boarded the Radiance of the Seas. We thought we would need a couple of nights to get over our jet-lag so we could enjoy the cruise and not spend our time sleeping at all hours of the day and night. As it turned out, we were fine pretty much from the moment we arrived. 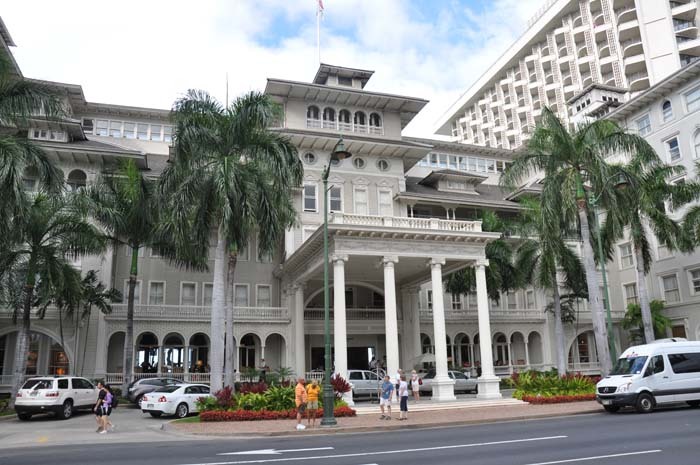 We flew into Honolulu at 7am and went straight to our hotel, the beautiful Moana Surfrider located right on the beach at Waikiki. Amazingly our room was ready (we had requested ahead of time but they made no promises) so we dumped our bags and went looking for breakfast. 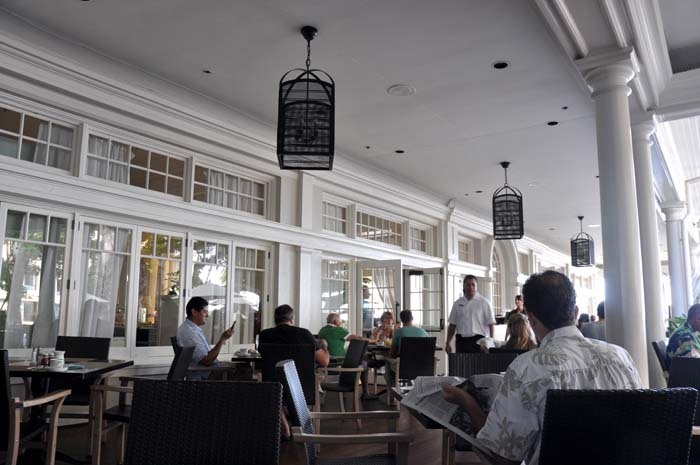 We wandered around but nothing grabbed us and we ended up next door to the Moana at Duke's for a breakfast buffet - just what the doctor ordered! After we'd eaten we went up to our room - by now around 11am - and slept for a few hours, then got up and the jet-lag was completely gone. It probably helped that Hawaii is 20 hours behind Australia, so our body clocks were almost exactly one day behind and we just needed a 'top up' sleep to get us back on track (just a theory). 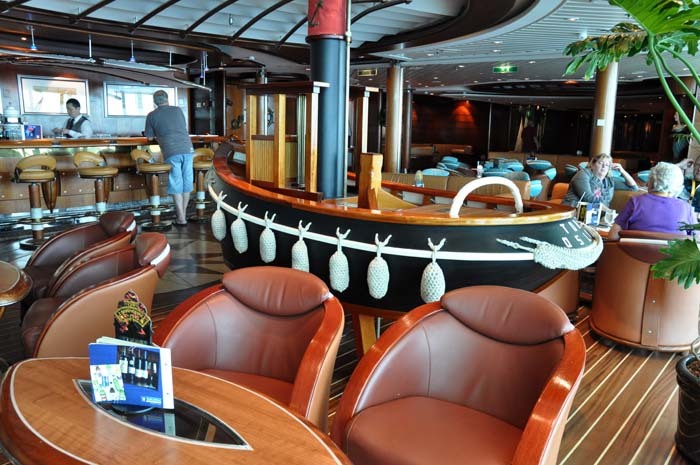 While we realise these ports-of-call photos will only be relevant to those people cruising from Honolulu to Sydney and vice versa, we've had lots of requests from people cruising from Sydney to Honolulu in April 2012, so have included them. To be honest Papeete wasn't one of our favourite places. 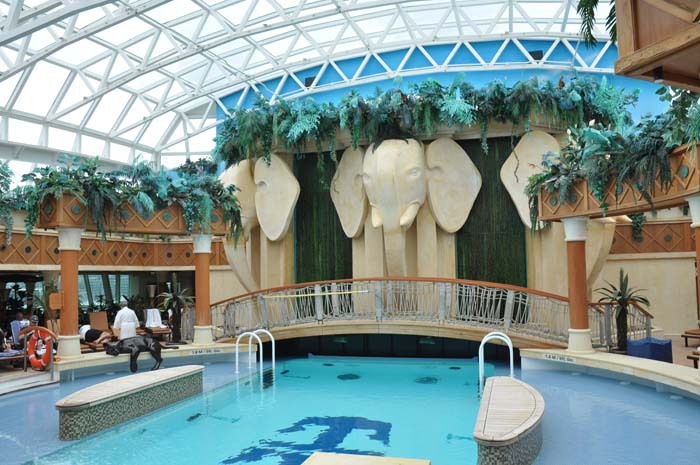 It wasn't helped by the awful weather which would have been more suited to staying on board the ship (which had docked at Papeete) and enjoying the spa, windjammers buffet, hot tubs, movie or taking a long nap or all of the above! As it was our first port of call we were excited to go exploring (despite the rain) and headed off the ship bright and early. At the dock we walked through a sea of tour buses and 4wds ready to take passengers to different parts of the island. We hadn't booked any tours on the ship and didn't take up any offers presented to us at the dock. Instead we opted to go for a walk and maybe take a local bus somewhere. 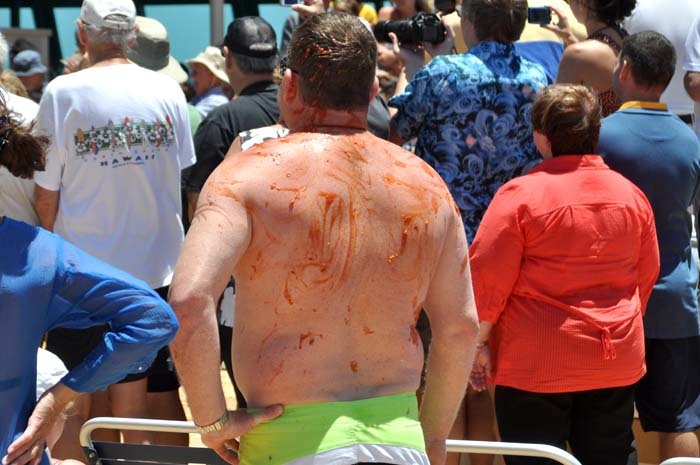 In hindsight maybe a tour would have been the way to go to experience a different side of Papeete. In the main town area we found it touristy and felt like it is the sort of place you need to keep your common sense in check when it comes to personal safety. I (Nat) bought some sarongs from the colourful market as gifts for friends back home and we spent a short while walking around the city before scampering out of the rain. Had it been a nicer day maybe we would have stayed in town for lunch but mostly we were happy to be back on the ship while it was quiet and relax - seeing as we were on holidays! This was our first experience with tenders (see Shore Excursions) and it ran smoothly, like a series of shuttle buses running between a hotel and airport (only minus the hassle of traffic or red lights!). 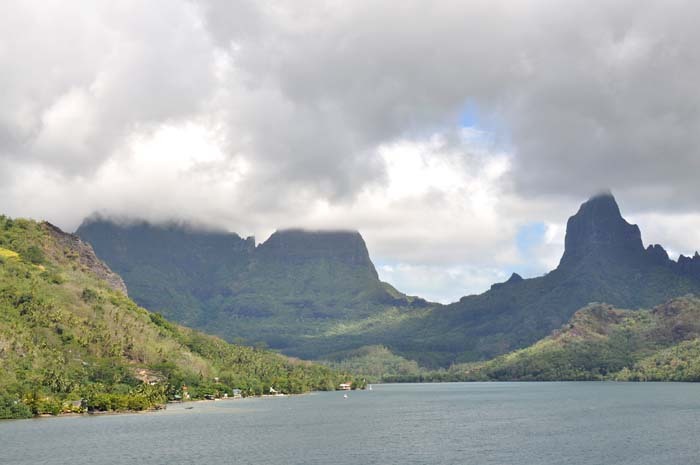 Once onshore at Moorea, we were greeted with a small market set up, I imagine, for the arrival of the Radiance. The market didn't just sell touristy 'junk'. There was some lovely pieces for sale - clothes (I, Giulio, bought a lovely shirt), artwork/sculptures, black pearls and food. The tour was good but the beach, quite small, was visited by several companies doing the same tour. 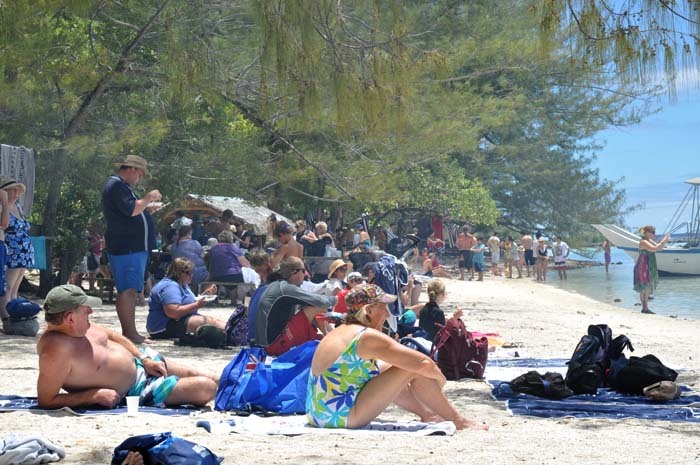 As a result, the beach got very crowded, very quickly, as did the water. Also, we'd been on the beach for 2-3 hours and, along with many others, were ready to head back. Our tour boat arrived with another load of people and, as we queued in the water to get back on, the boat left and headed off empty. We, and many others, then had to sit for over an hour (all watching the horizon) for the boat to return. Then it was first come, first serve, as everyone clambered to get on board. It was crazy logic that the boat went back empty when people were queuing to go. 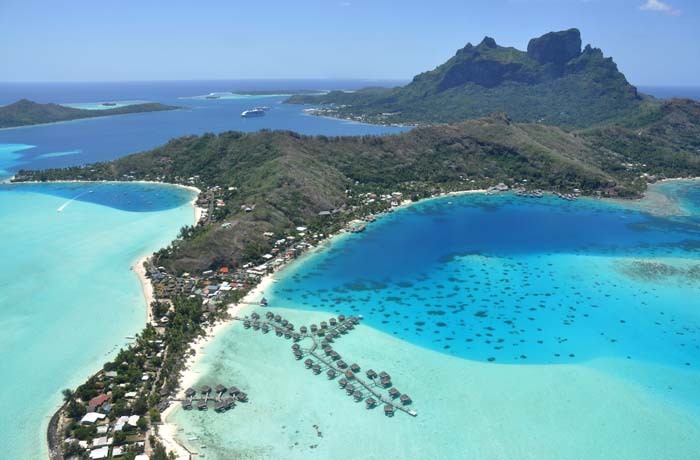 Bora Bora is one of those 'bucket list' destinations and on a perfect spring day it doesn't disappoint. 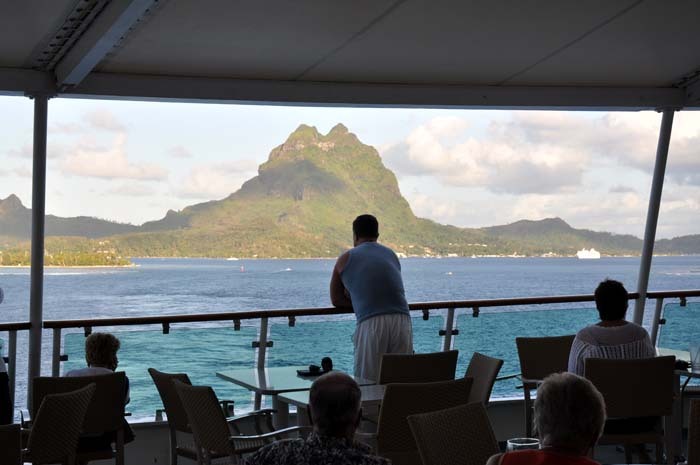 After our experience of choosing a tour bought at the dock for Moorea we did the same in Bora Bora. We headed for the tenders during the 'free no tender ticket needed' window of 7 - 7.45am and the whole process was smooth sailing - so to speak! Arriving on the dock there were quite a number of tours to choose from. 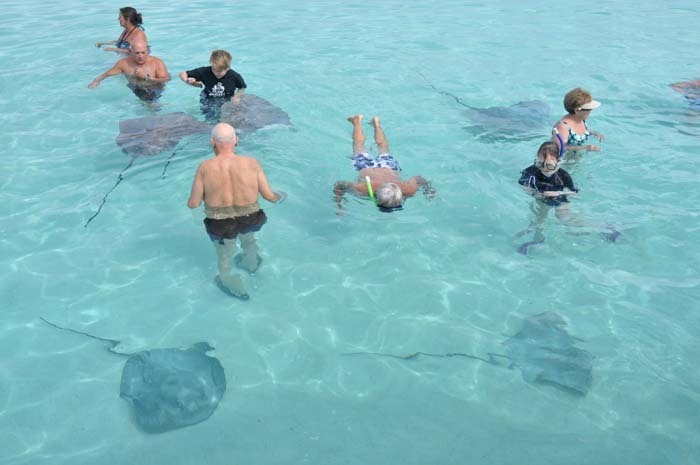 There were snorkelling / island visit tours as well as quite a number of bus tours. 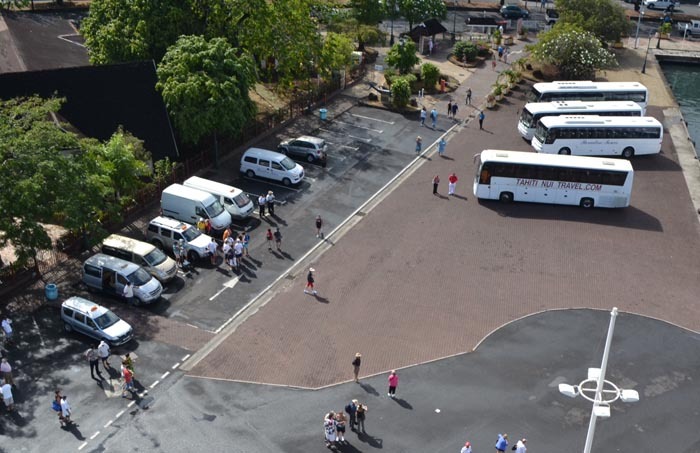 We opted to do one of the 2 hr circuit island tours on the local 'Le Truck' - these are local buses that looked like they were brought out in the masses for ships in port. The bus we choose was $25 each (we paid in French Polynesian Francs but you could also pay in Australian or US dollars) and proceeded to pile into an open-sided truck with wooden bench seats...and then we waited..and waited... as our 'host' was back at the dock drumming up more passengers - though all the current passengers felt like we were full enough. It did get to the point where it was obvious quite a number of ship passengers were going to be piled in with us making the experience less than desirable - so we decided to get off that bus and look for an alternative activity. We got a refund easily and went for a walk around the dock area deciding what to do. Cut a long story short we found a new guide with a much more comfortable mini-bus (with air-conditioning!) that seated about 12-15 and we were the last passengers to board so off we went! This bus still only cost us $25. The tour was entertaining and the vistas beautiful. Our guide seemed like a bit of a local legend and he certainly revelled in his role. Plenty of photo stops and overall a great way to get an idea of the island. The ship offers this exact same tour for $59 and we constantly ran into friends of ours who had paid for a ship organised tour throughout our tour. We visited a market, sarong maker and spectacular beach complete with the daydream-inducing white sand and topaz blue lagoons. A very short pit stop was made at the home of Bloody Mary's..though we're not exactly sure why - except, if you crossed the street, it offered a great view of the ship. Back at the dock we went in search of what we came for - a helicopter ride! Thanks to my (Nat) mother's generous birthday gift (for said milestone birthday mentioned at the start of this blog) we were able to experience a breathtaking flight over the island. Being my first time in a helicopter I couldn't think of a better way to start my love of choppers! A quick spot of shopping (for Giulio's mother's birthday present) and a bite to eat at the snack bar (accepts US or French Francs) we then went back to the ship to order our much loved cheese platter and champagne to say goodbye to a gorgeous port of call. It's just across 'the ditch' from where live in Australia but we'd never been to New Zealand and didn't know what to expect of its biggest city (population 1.4 million). We were only there for one night/two days but we loved what we saw of 'the city of sails' and have every intention of going back for a longer stay. 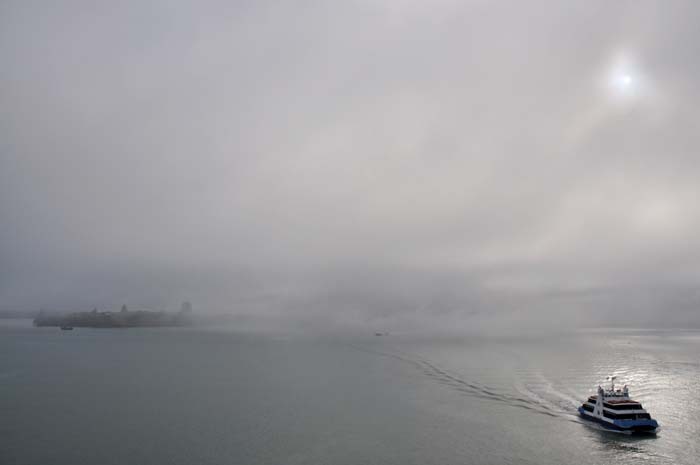 The Radiance berthed at Auckland and the port is right on the doorstep of the CBD. You get off and you're smack-bang in the middle of downtown Auckland. After a very quick walk around part of the CBD, we headed to the bus stop for the 'Auckland Explorer', located a couple of hundred metres from where the Radiance was moored. 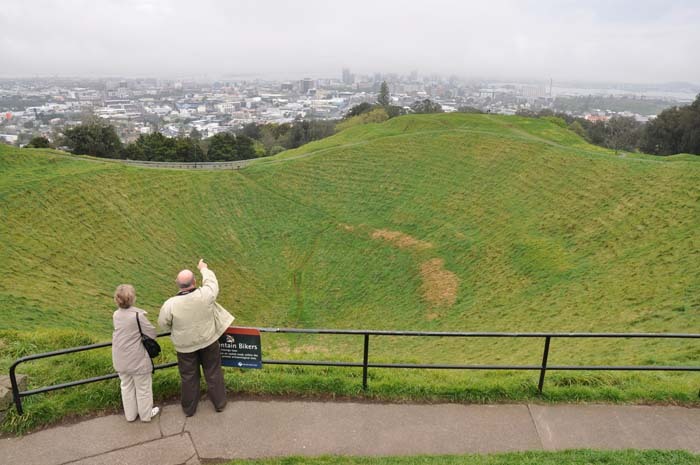 The Auckland Explorer is a 'get on, get off' bus that departs every 30 minutes and the stops include the Auckland Museum, the Auckland Zoo and Mt Eden, the highest point in Auckland with spectacular views of the city and harbour. A full circuit, if you don't get off, takes one hour (one hour ticket - $25). Otherwise, a one day ticket is $40 and a two day pass is $65 (the 2nd day of the pass doesn't have to be consecutive). We opted for the one day pass and found that was fine. We even got off in Parnell, a lovely inner-city suburb and had lunch, then walked the rest of the way, getting a close up view of part of the city. While there is a million-and-one things to do and see in a city this size, the one thing we didn't do was the Sky Walk around Auckland's Sky Tower (the needle-type building in the photo immediately below). 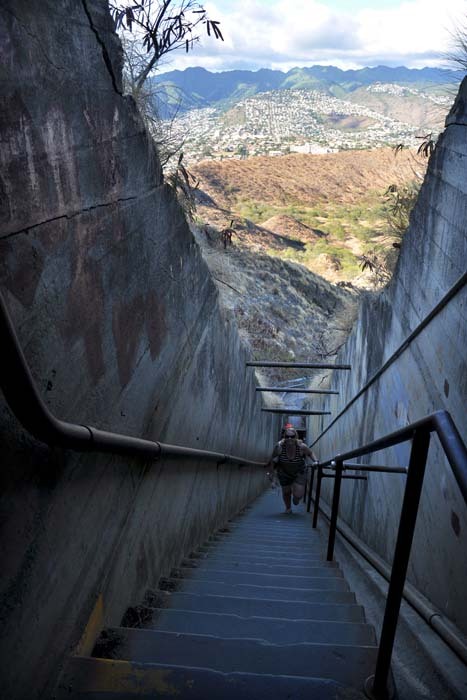 This involves walking on a 1.2 metre-wide walkway on the outside of the building 192 metres (630 feet) above the ground, no handrails and nothing but air on either side of you! However...you are connected to the building by a cable/harness. As of November 2011, cost was $145/adult and $115/child (or $460/family of 2 adults/2 children). Alternatively, if that doesn't 'rock your boat' enough, while you're at the Sky Tower you can partake in the 'SkyJump', which can best be described as base jumping attached to a wire (192 metres - 630 feet) . You fall at approximately 85kph (53mph) for around 11 seconds, and then come to a smooth landing in the plaza below. As of November 2011, cost was $225/adult and $175/child (or $700/family of 2 adults/2 children). Call us 'scaredy-cats' but we only opted for the relative safety of the Auckland Explorer and the closest we got to the Sky Walk or SkyJump was cringing with fear on the deck of the Radiance as we watched both take place from afar. Our final port-of-call (boohoo!). Still, the view from where the Radiance was docked was quite spectacular. THE END - THANK YOU AND BON VOYAGE! 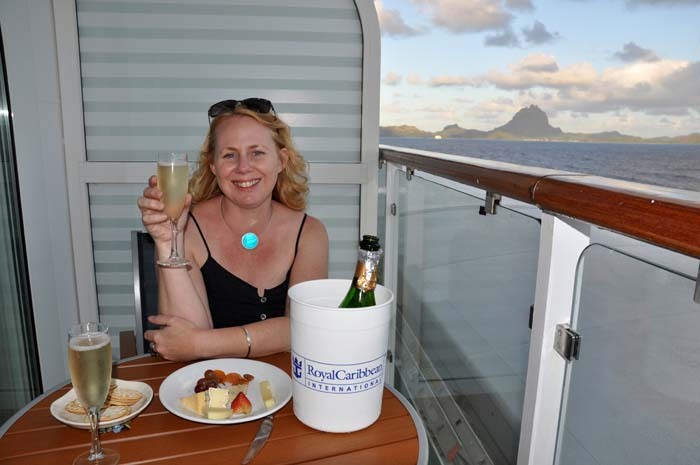 On October 22, 2012, we boarded Royal Caribbean's Voyager of the Seas in Singapore and spent 14 nights cruising to Fremantle in Western Australia. Read about this amazing ship HERE. Also, some of Giulio's 'work away from work'.. I was born in Rome, Italy, in 1968 to Australian parents doing the 60s thing. We moved back to Australia, and Brisbane, in 1974. I graduated from high school in 1985 and spent the following year working several part-time jobs. It was during this year I began taking photos and gained entry to the Queensland College of Art, studying there in 1987-88. I took up a cadetship at the Canberra Times newspaper in 1989 and moved back to Brisbane and The SUN newspaper in 1990. I began freelancing in 1991 and, at six weeks notice, set off for Scotland with two mates in 1992, where I remained for five-and-a-half years, having photos published in every major Scottish and London-based newspaper. At the start of 1998 I left Scotland and hitchhiked all the way around Australia photographing everyone who gave me a lift and writing about each hitch. I live in Brisbane and continue to work in the media. I have self-published two books - …so I did, which recounts my hitchhiking journey around Australia and Deep Fried Pizza, a novel about the world of news photography (links below).